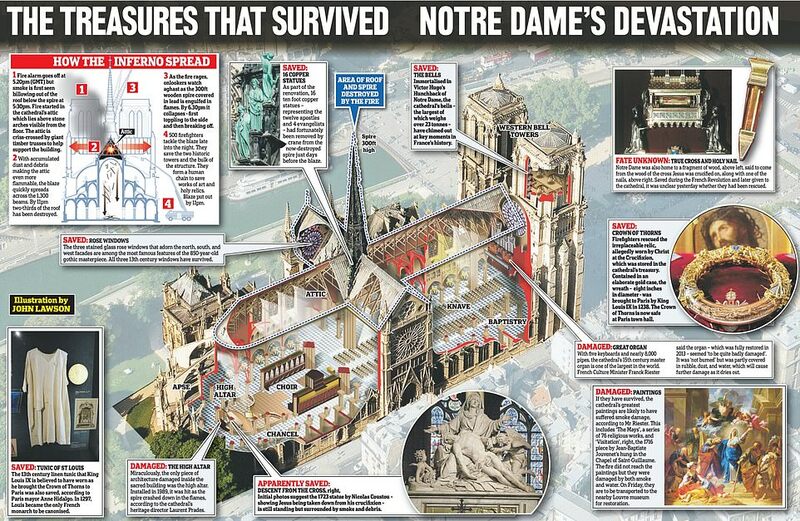 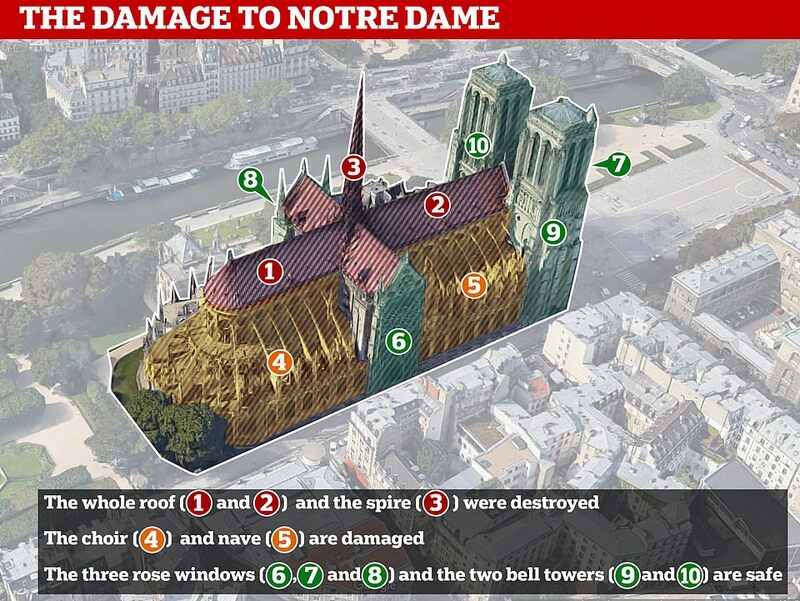 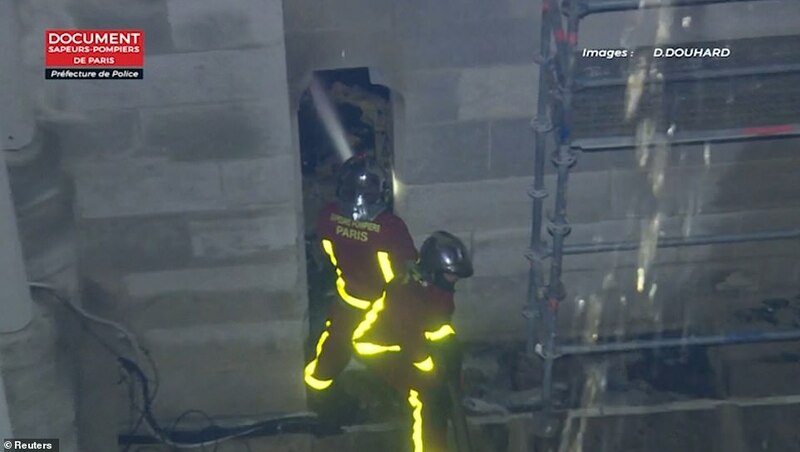 Notre Dame was just 30 minutes from completely collapsing before heroic firefighters managed to stop the inferno on Monday night – it has been revealed. 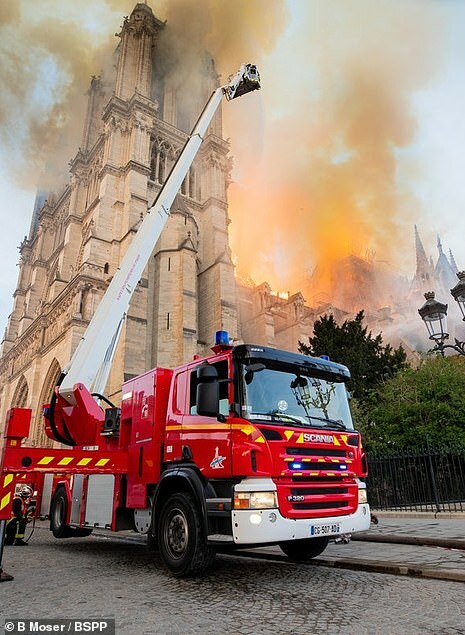 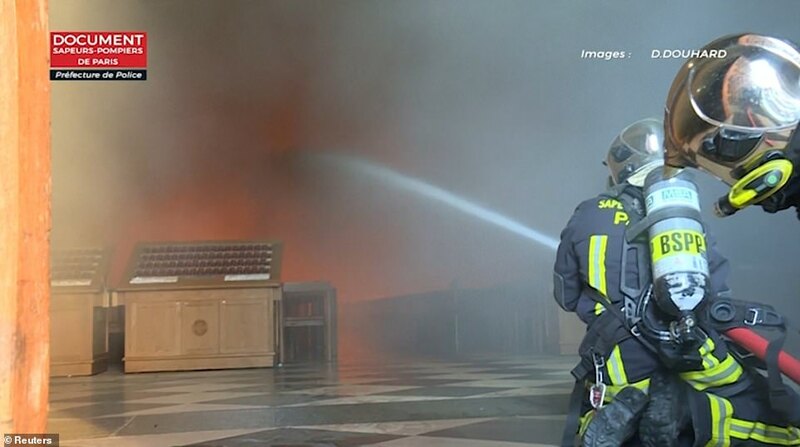 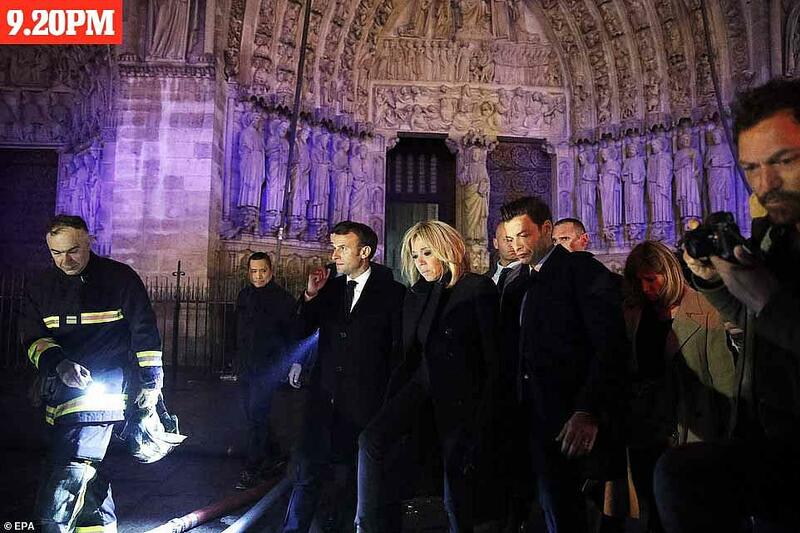 Laurent Nuñez, the French junior interior minister, said a group of around 20 firefighters managed to stop the blaze from spreading to the church’s belfries – which saved 13-tonne bells from tearing apart the remaining structure. 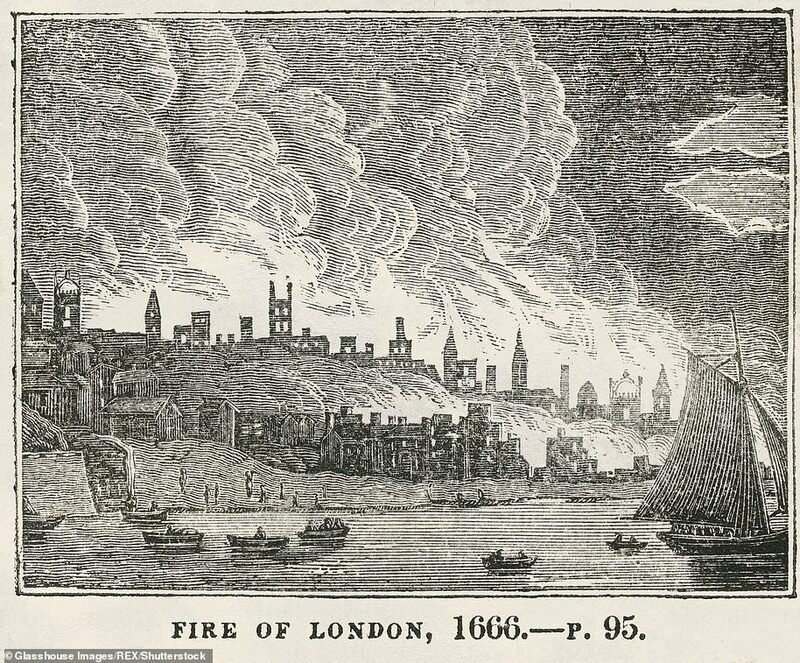 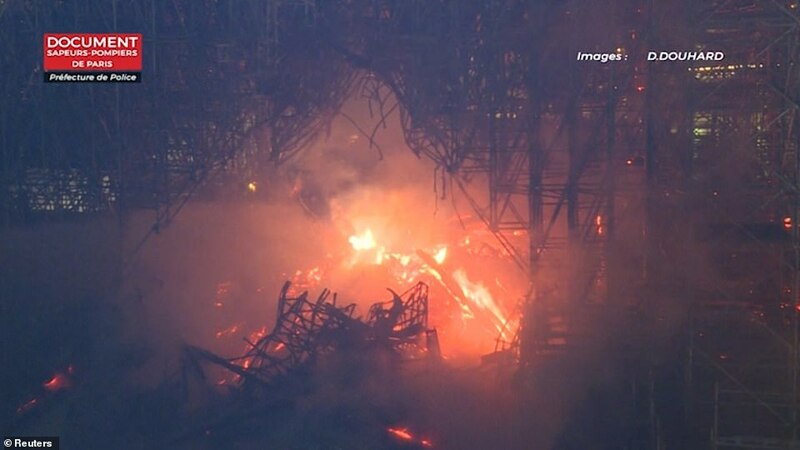 Experts warned officials during Monday night’s disaster that if the wooden belfries fell victim to the blaze, the weight of the bells falling would almost certainly have destroyed the towers below. 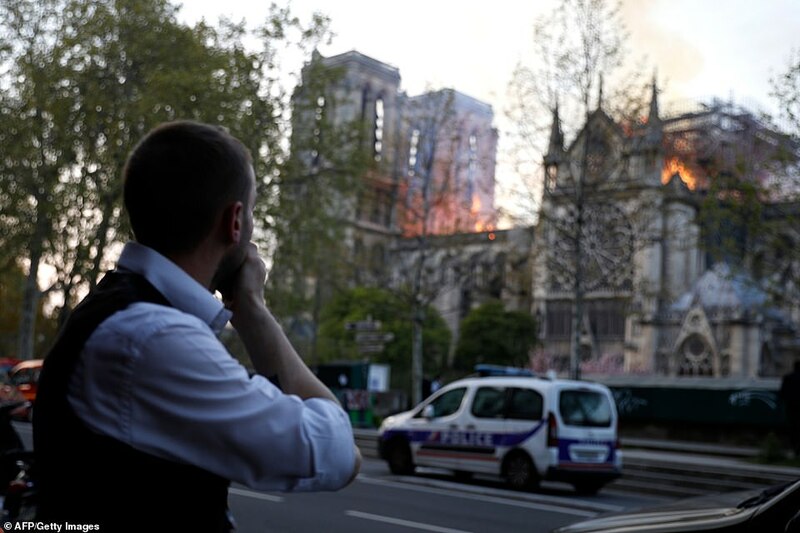 Mr Nuñez said firefighters entered the towers ‘at the risk of their lives’ with less than half an hour to spare before the flames chewed through the belfries. 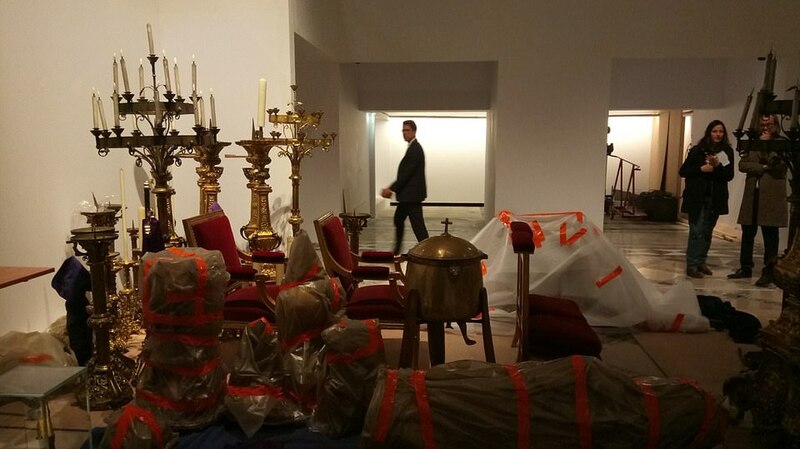 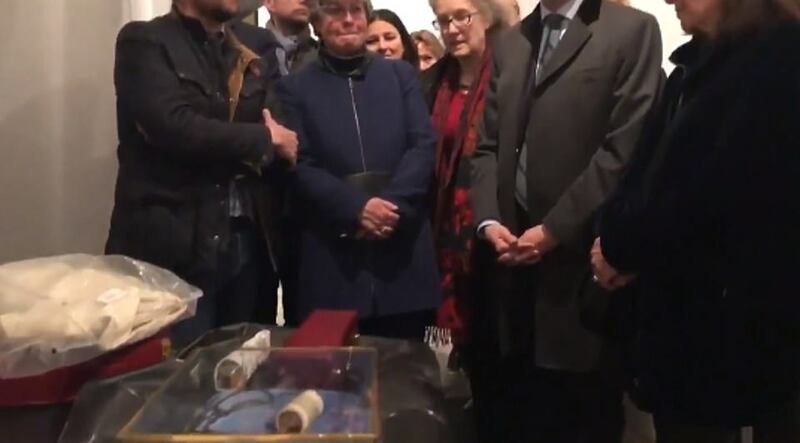 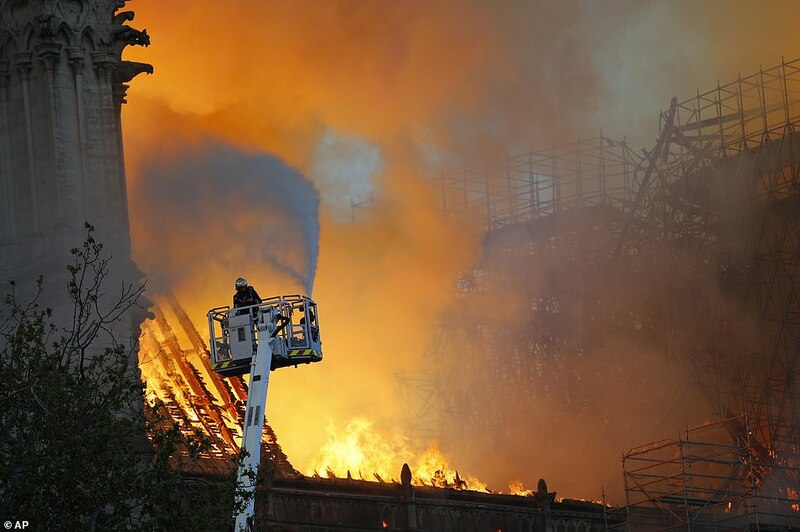 On Tuesday, the government revealed which treasures survived the fire – with the great organ and several priceless paintings rumoured to have been destroyed. 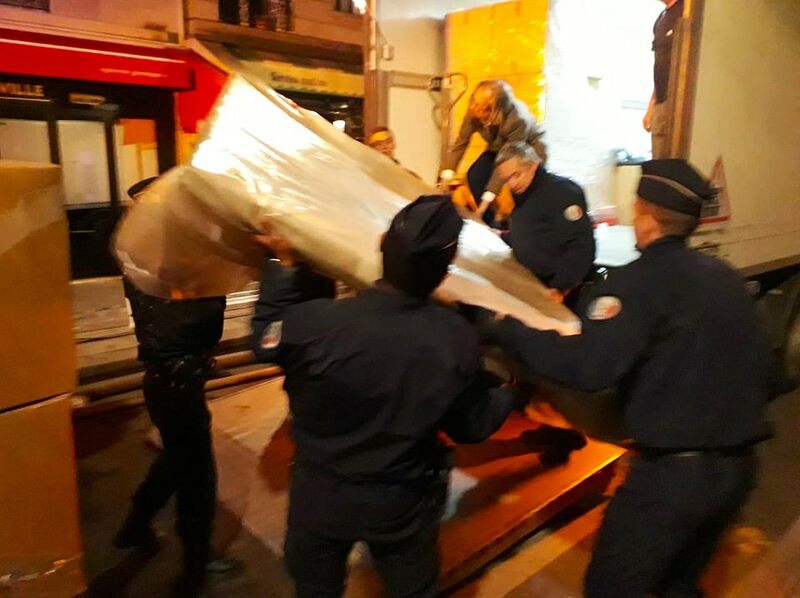 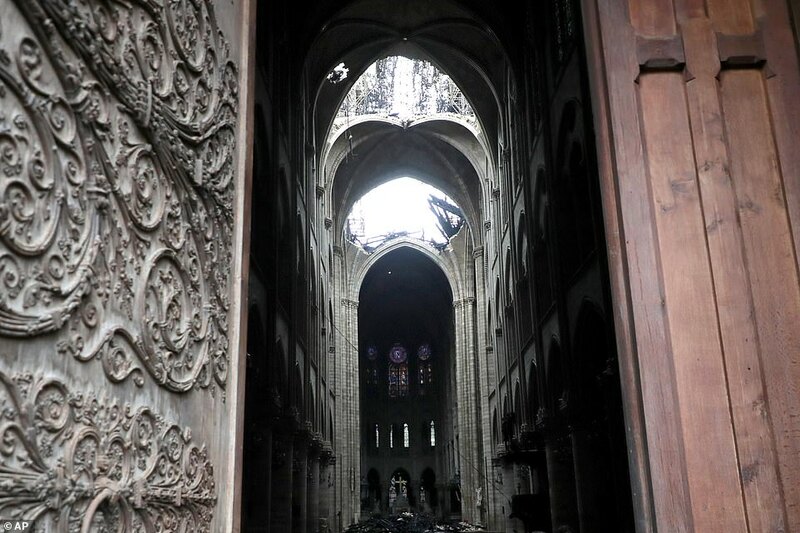 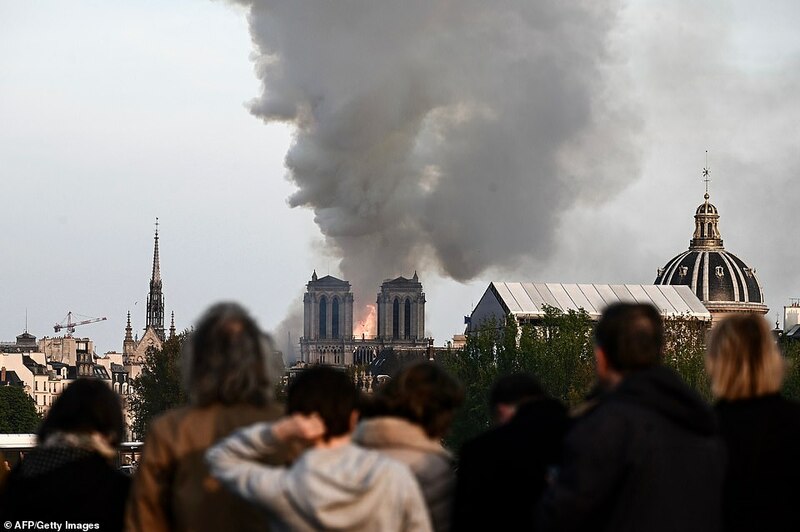 Franck Riester, France’s culture minister, said on Tuesday that the cathedral’s main organ ‘seems to be quite affected’ by the blaze while the fate of several other artefacts remains unknown. 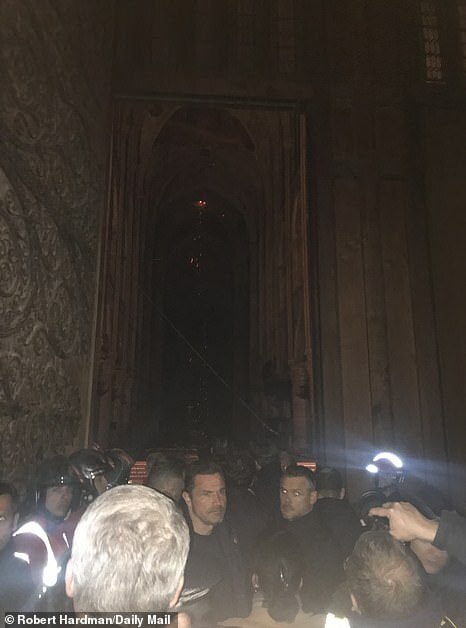 A British choir performed the last concert at Notre Dame before the devastating fire. 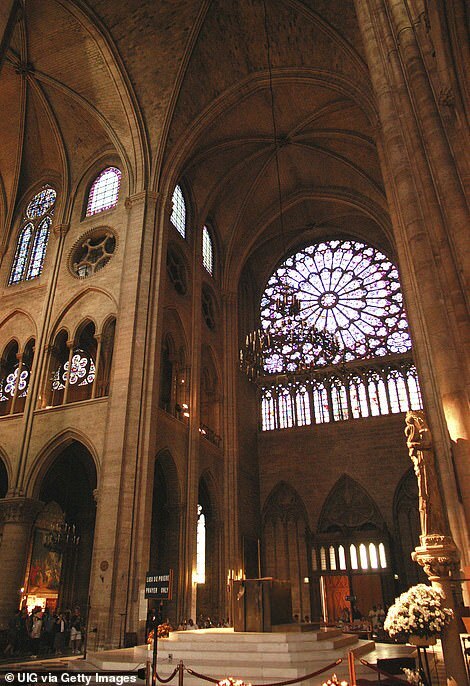 Twelve members of I Dodici sang choral works in front of the cathedral’s altar on Monday morning. 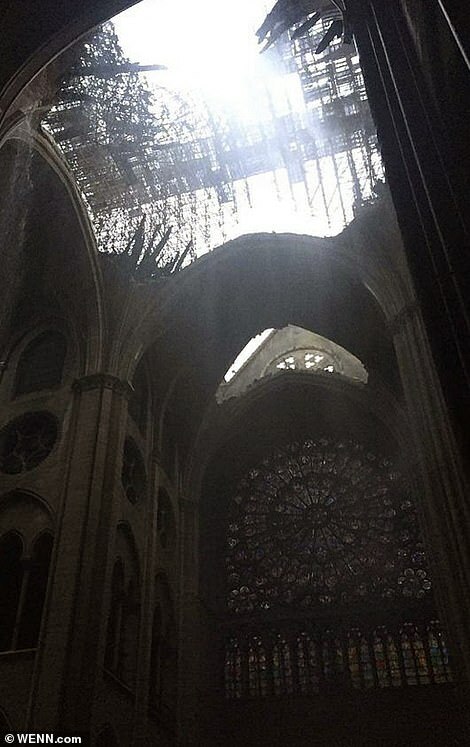 A video filmed by an unknown member of the audience shows the sunshine gleaming through the magnificent stained glass. 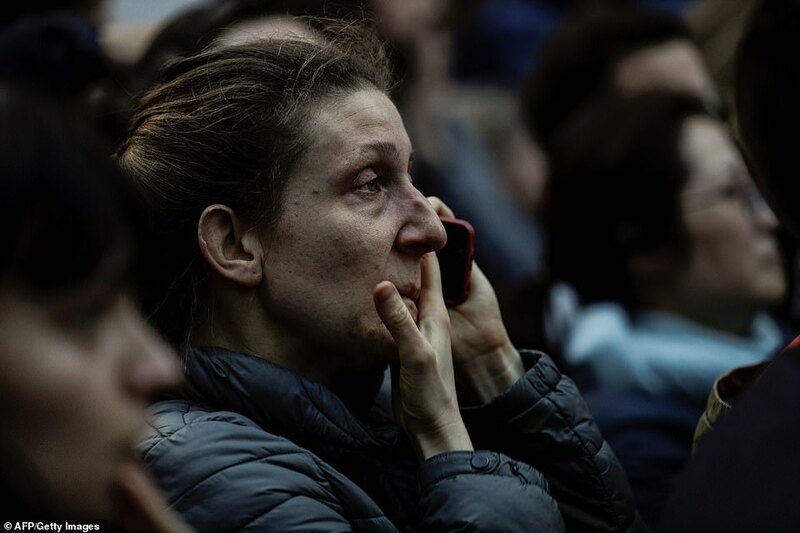 She later sent the footage to the London-based group and told them of her ‘immense pleasure’ at attending the poignant concert with her husband. 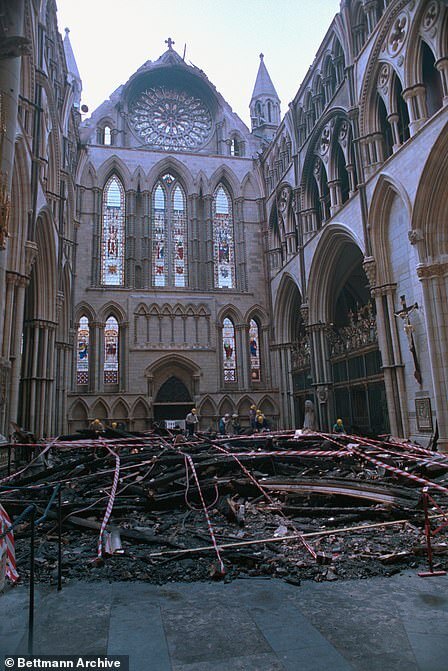 ‘The large paintings, at first glance, have not been affected by the fire. 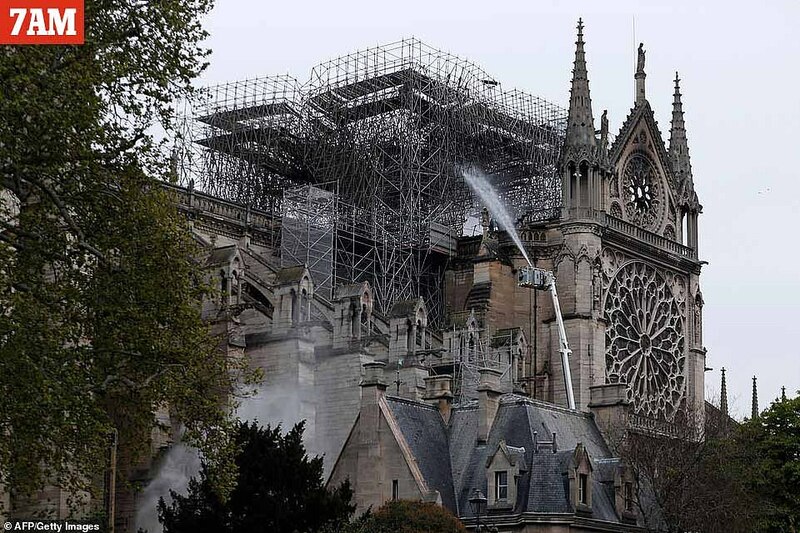 But, often in these situations, there is water damage,’ Mr. Riester added. 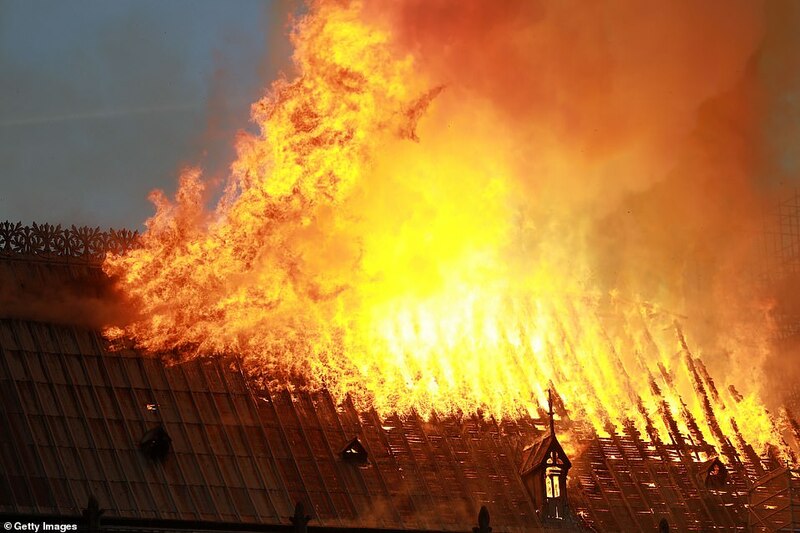 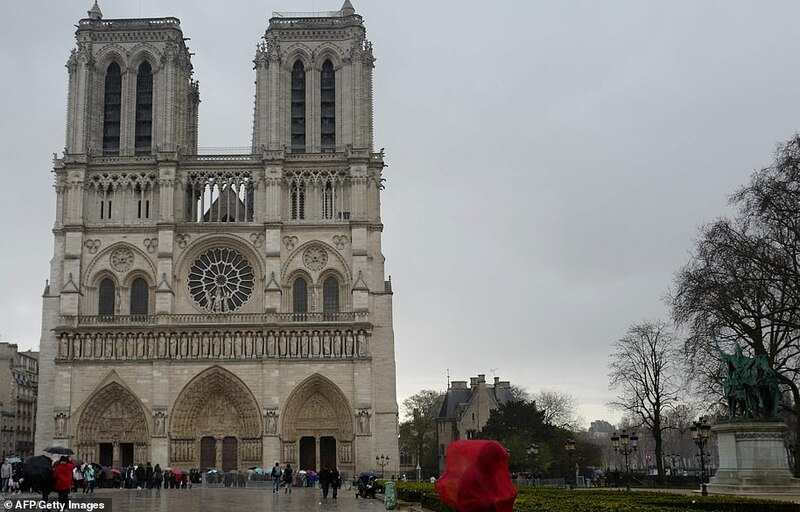 It comes as it was reported officials attending the Notre Dame blaze initially couldn’t find any sign of fire despite the alarm being raised 23 minutes before the structure went up in flames. 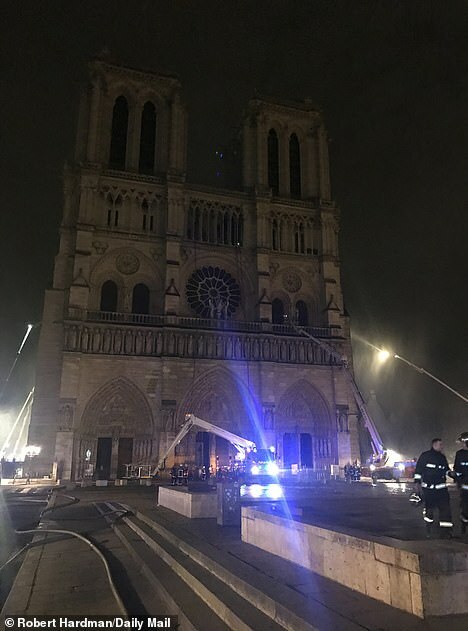 Mr Heitz said this evening: ‘What we know at this stage is that there was an initial alarm at 6:20 p.m., followed by a procedure to verify this but no fire as found. 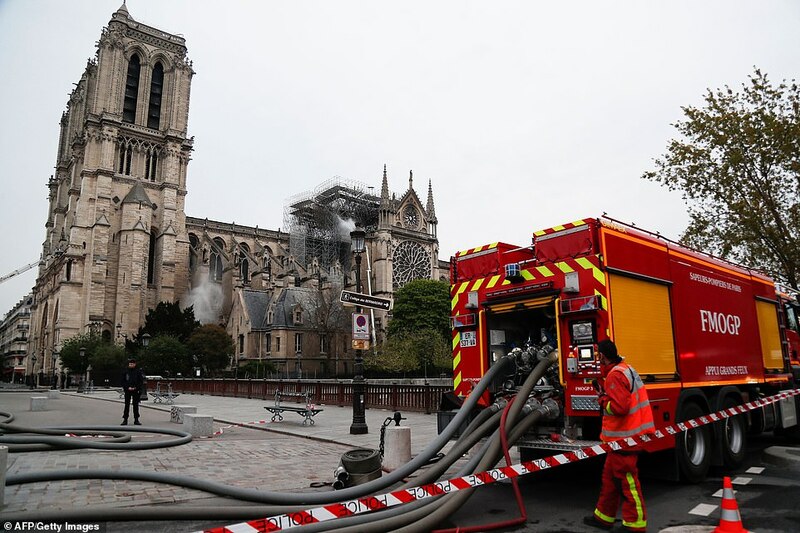 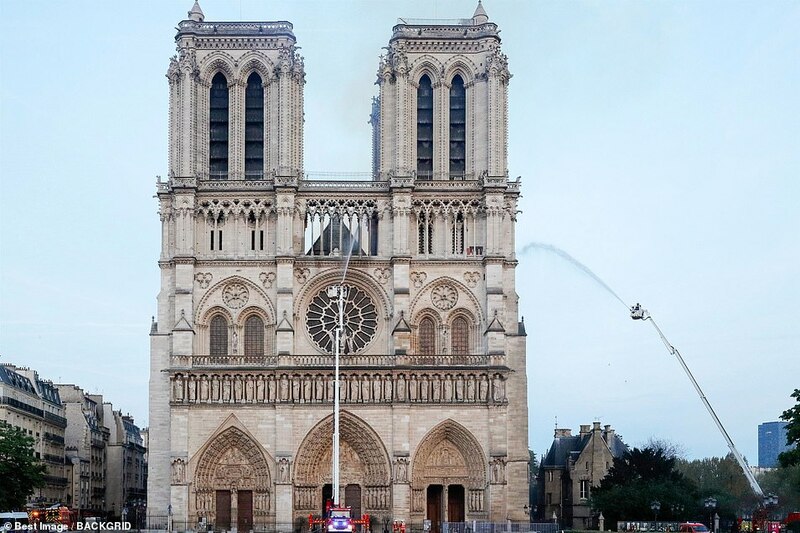 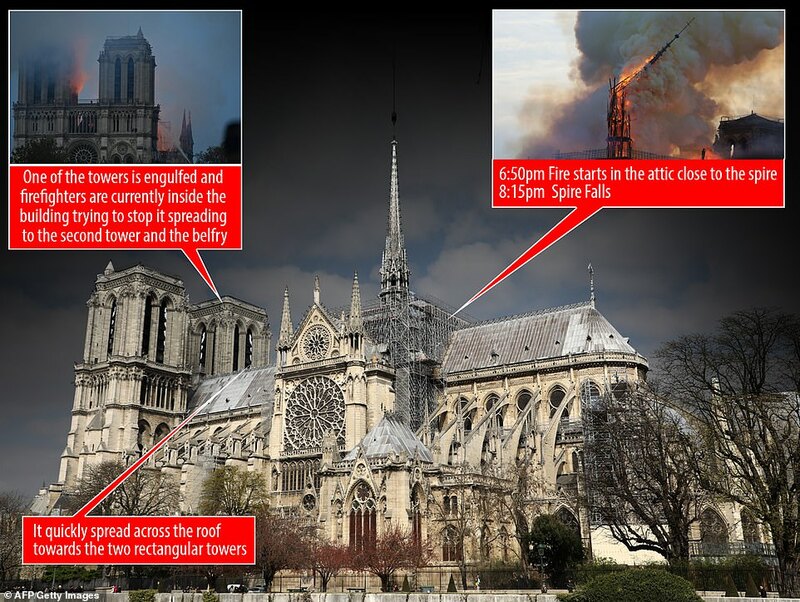 Firefighters battled for eight hours to contain the blaze which destroyed the cathedral’s roof and spire, but despite fears that the whole building could collapse the stone structure and iconic bell towers remain standing today. 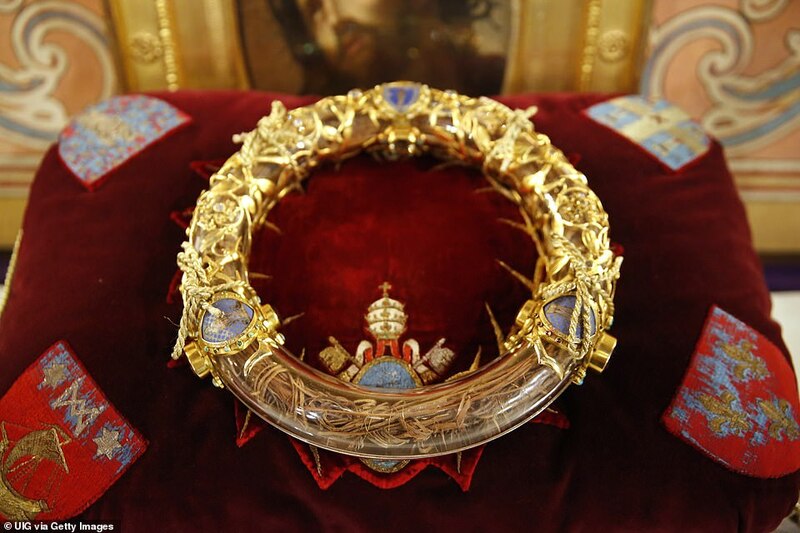 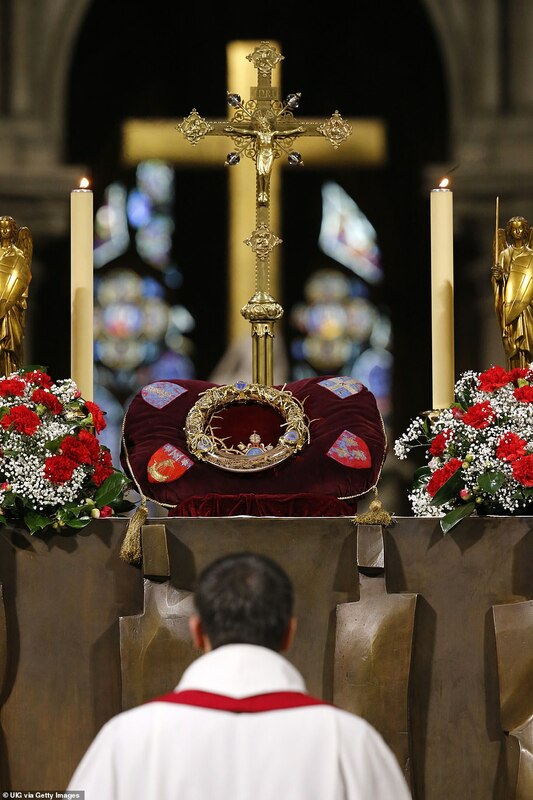 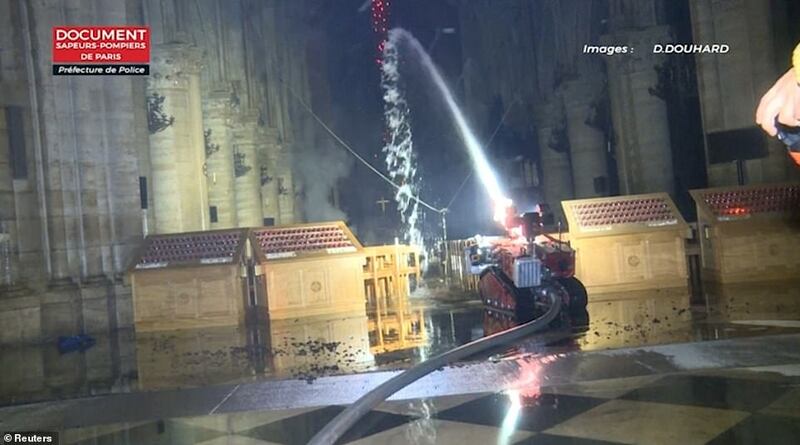 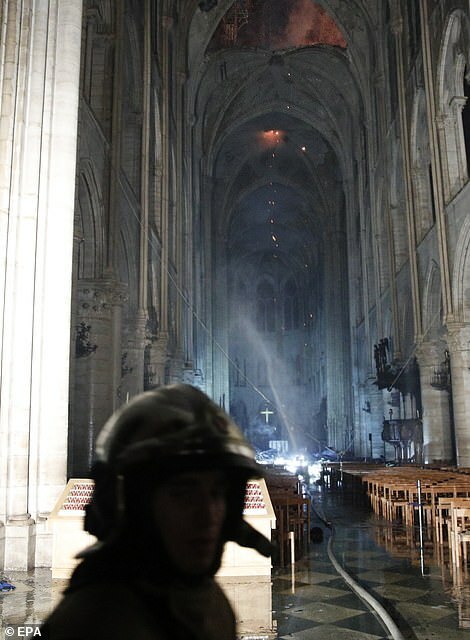 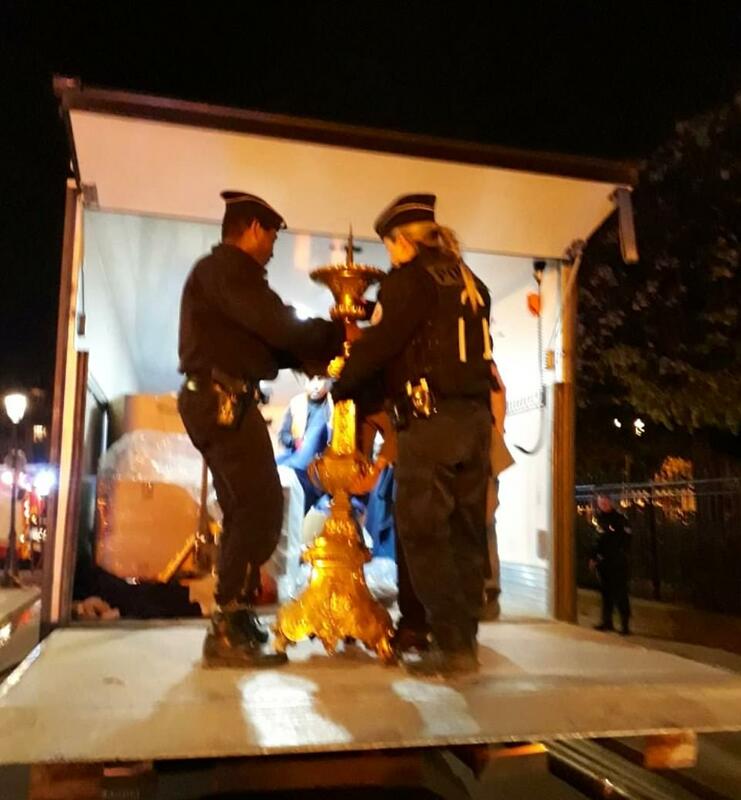 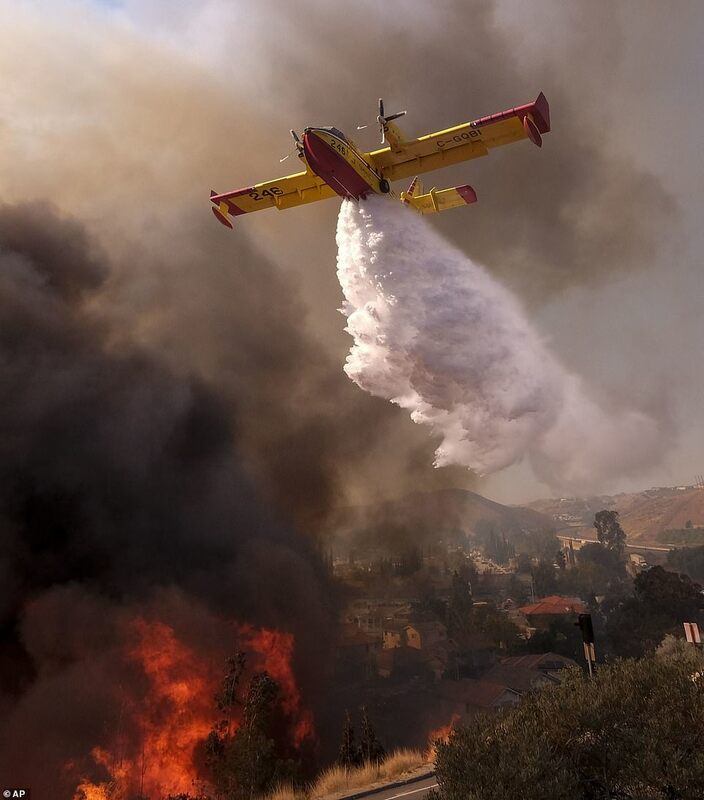 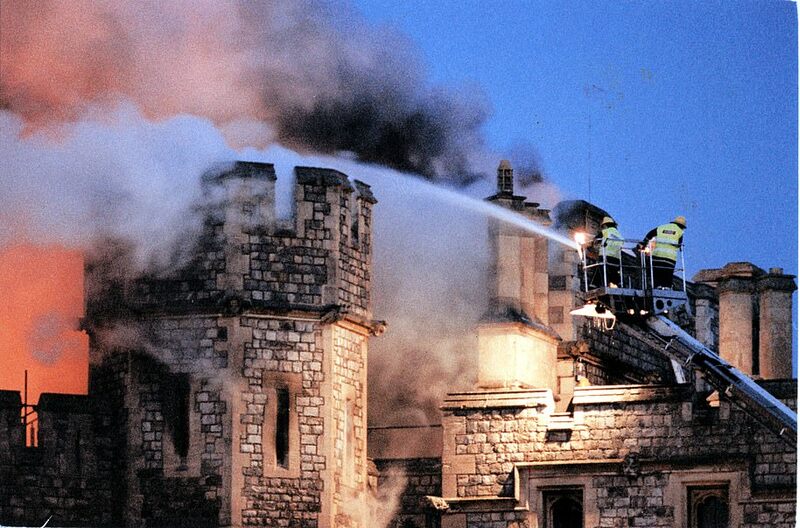 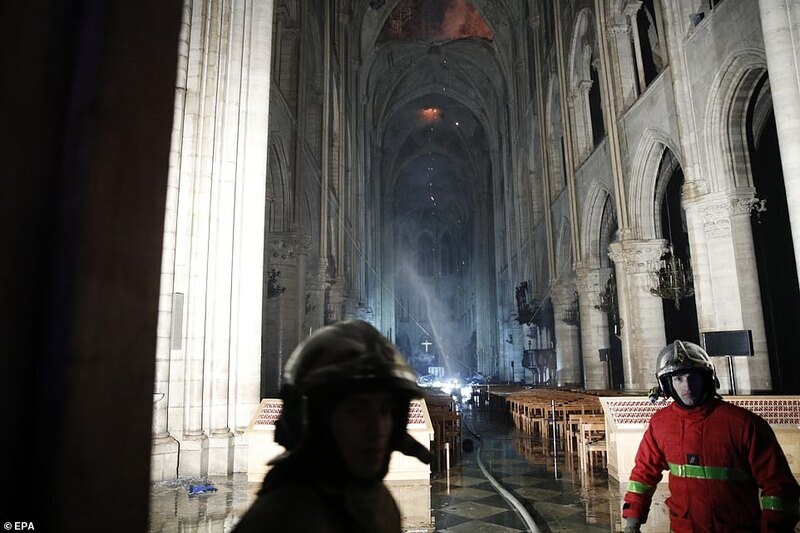 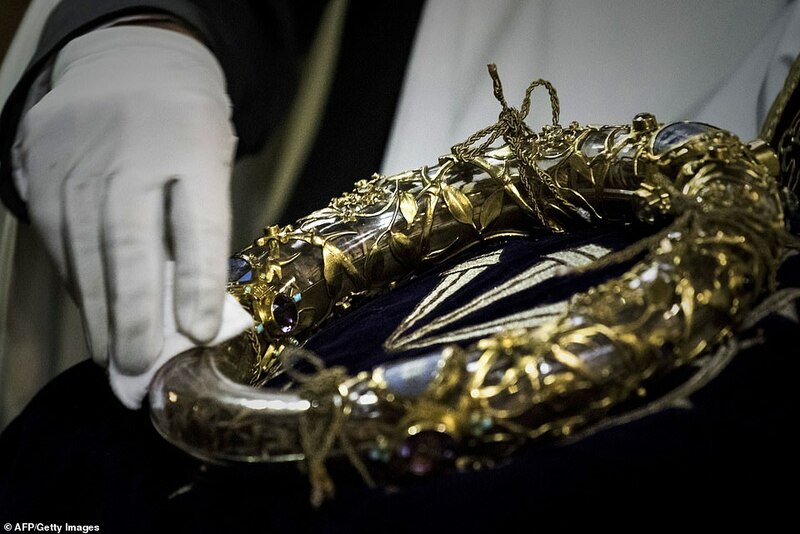 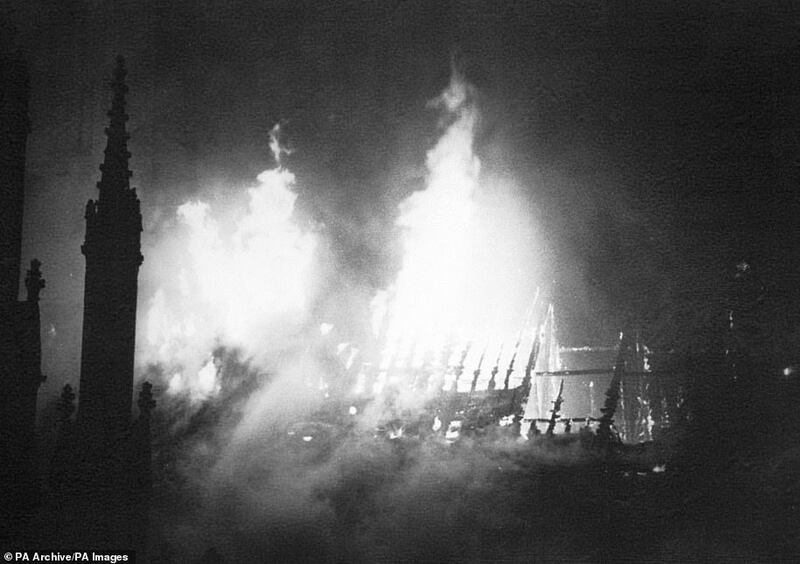 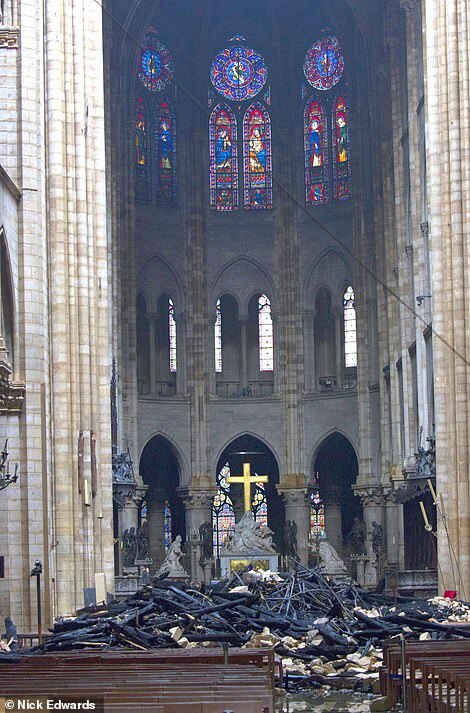 The firefighters’ actions – and their quick deployment of a robot to hose down the cathedral – meant that priceless treasures including reputed relics of the Crucifixion and 13th-century stained-glass windows were saved from the blaze. 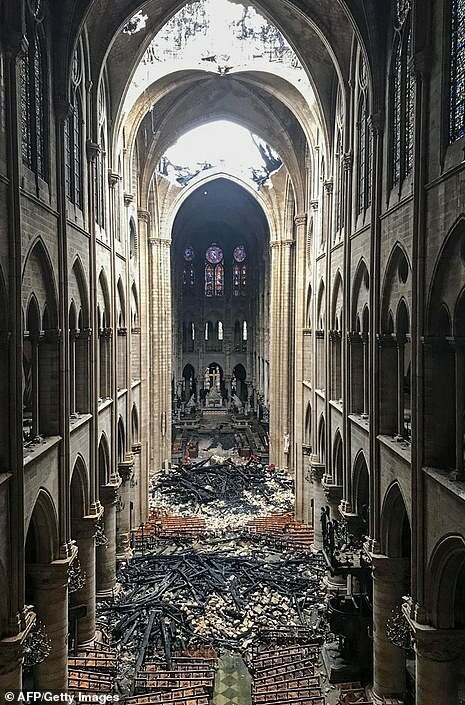 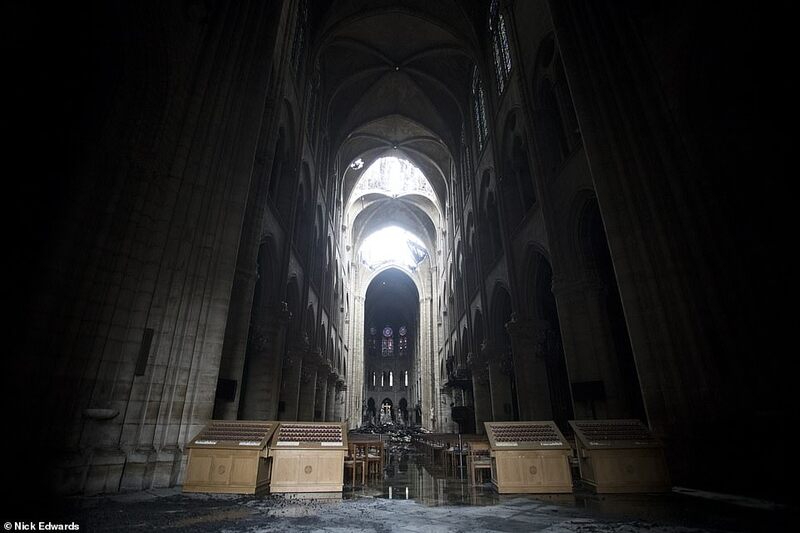 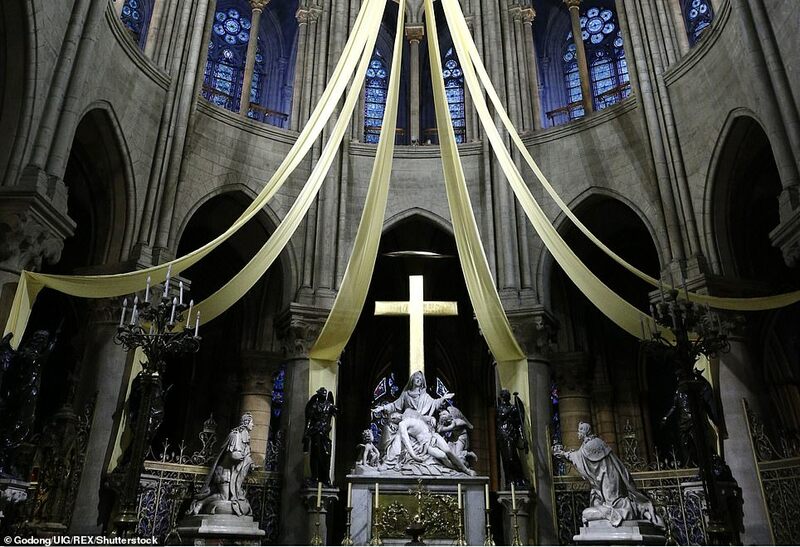 Today haunting new photos of Notre Dame’s interior showed debris strewn across the floor – as experts warned the damage could take decades to repair – while detectives probe the renovation work which may have led to the blaze. 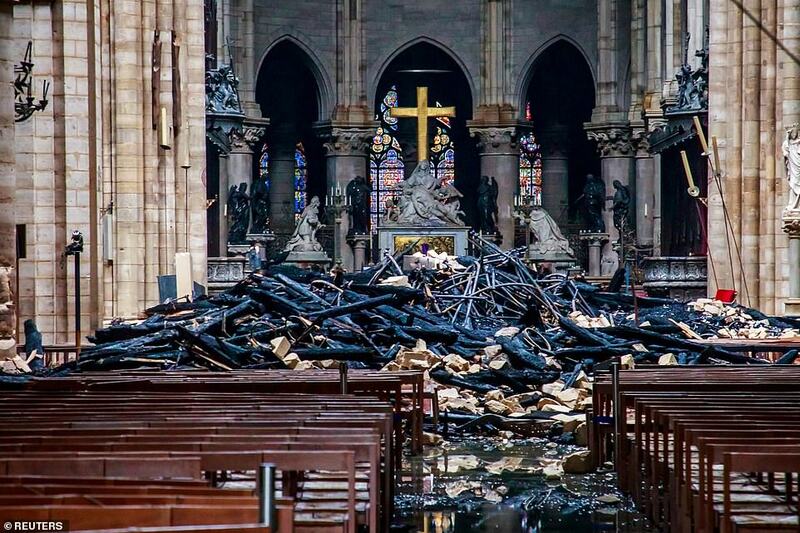 The pictures revealed that a statue of Jesus descending from the cross, positioned on the altar, was preserved among the smouldering rubble after the roof was destroyed by Monday night’s fire. 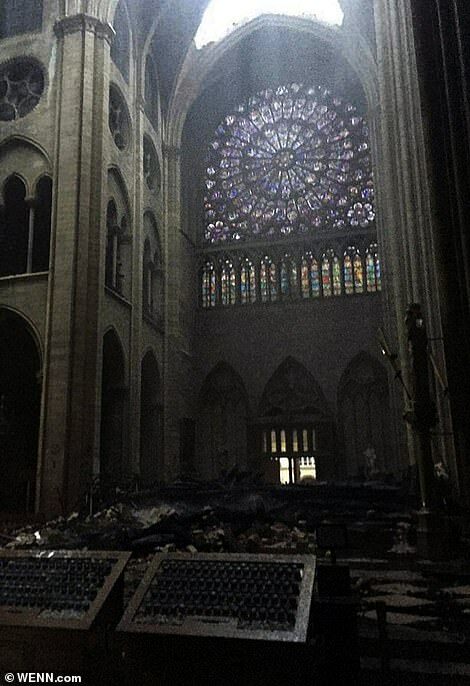 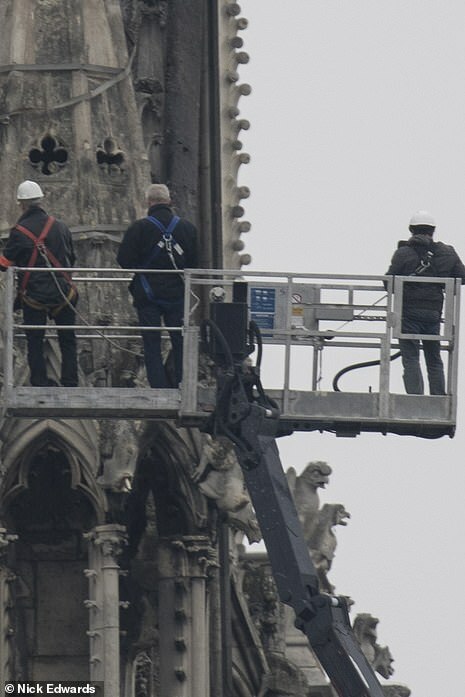 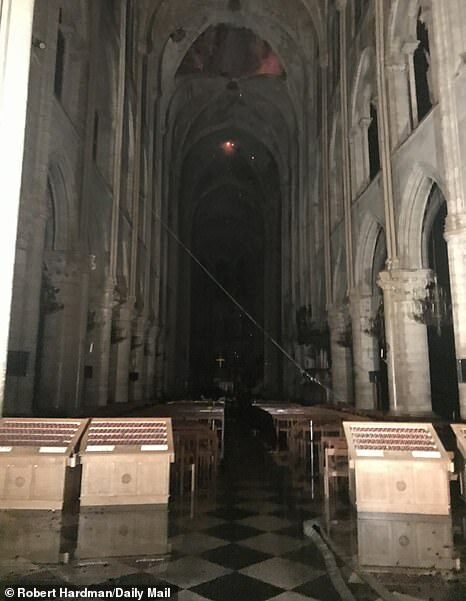 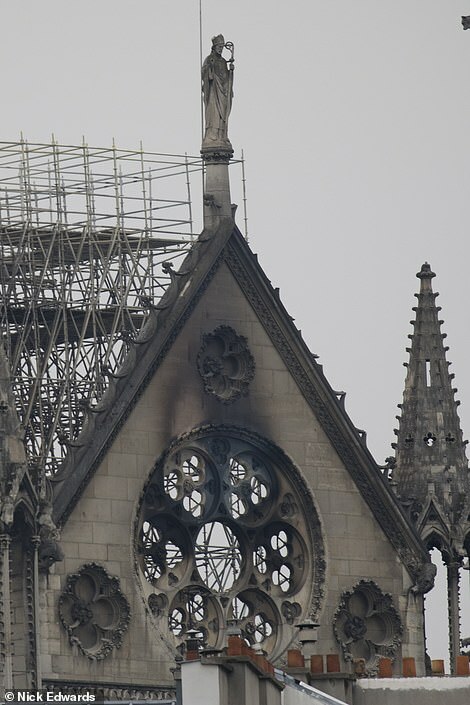 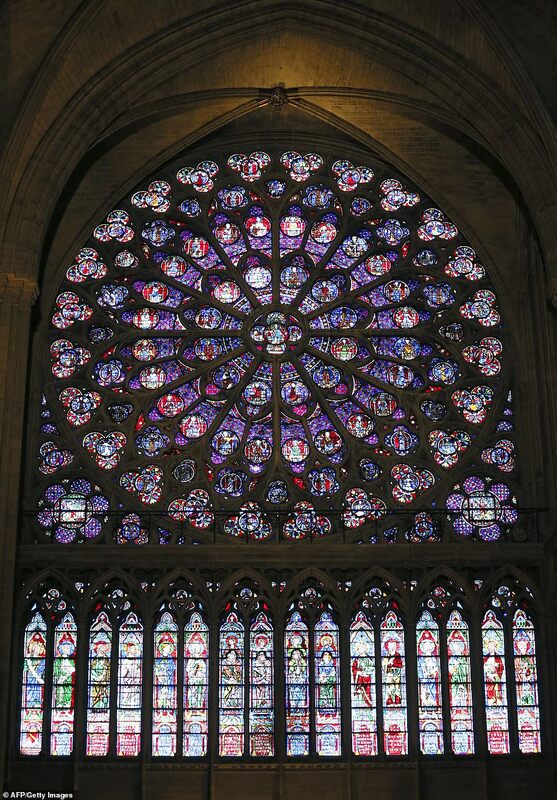 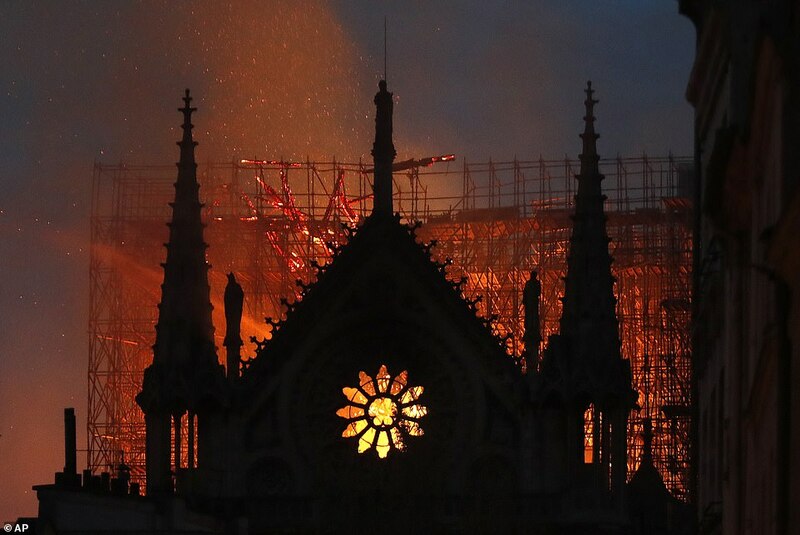 The three ‘irreplaceable’ Rose Windows, which date to the 13th century and were last night feared to have melted or exploded, were also intact. 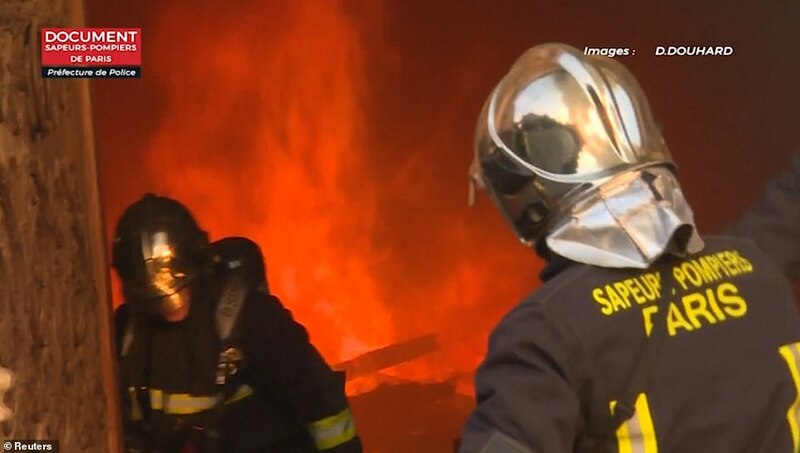 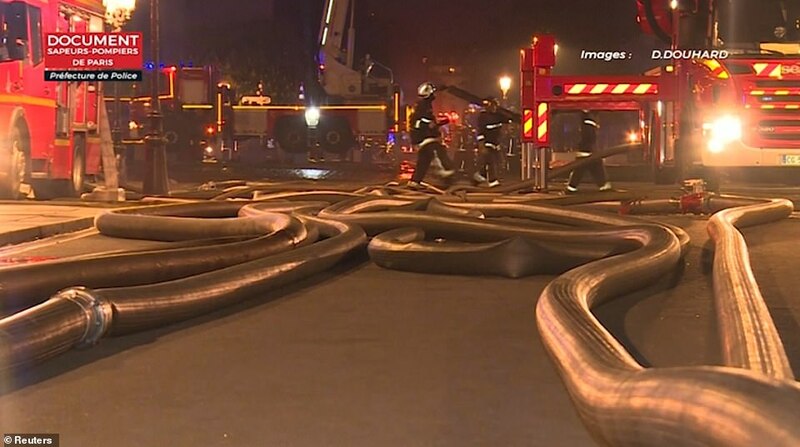 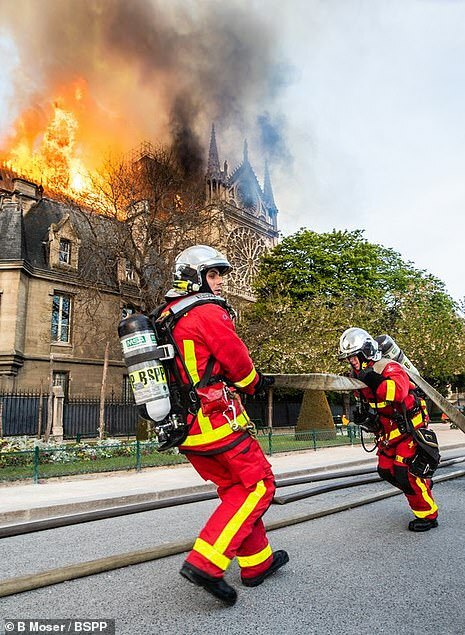 French police are understood to have launched a criminal inquiry after a ‘stray flame’ caused fire to engulf the landmark last night, with heroic firefighters battling for eight hours to bring the blaze under control. 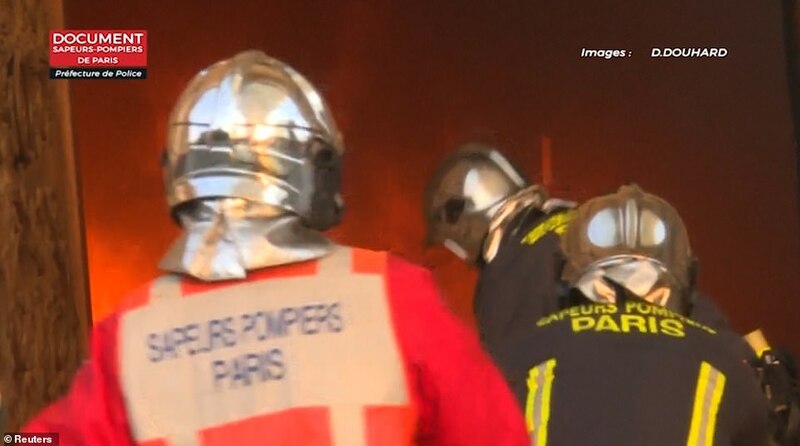 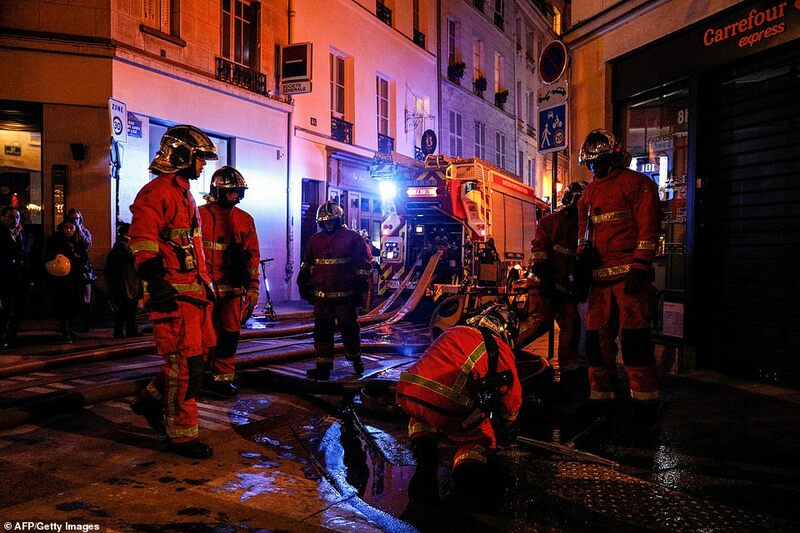 The Paris prosecutor’s office is probing ‘involuntary destruction caused by fire’, indicating authorities are treating the blaze as a tragic accident and not arson or terrorism. 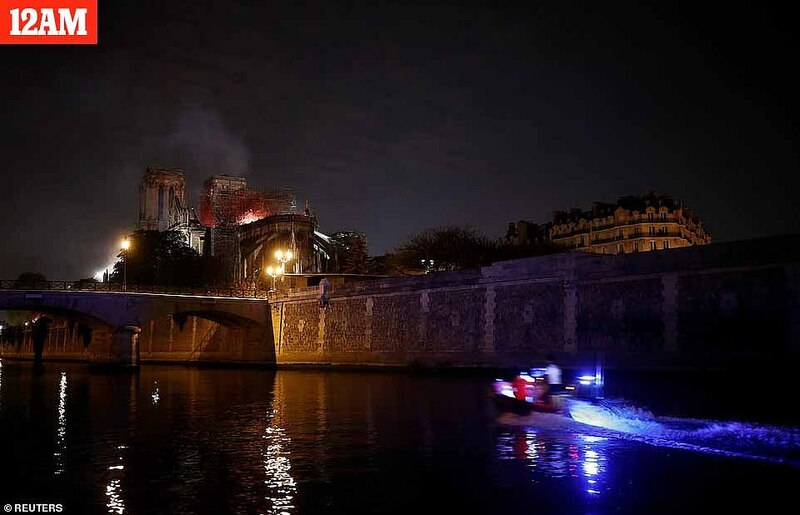 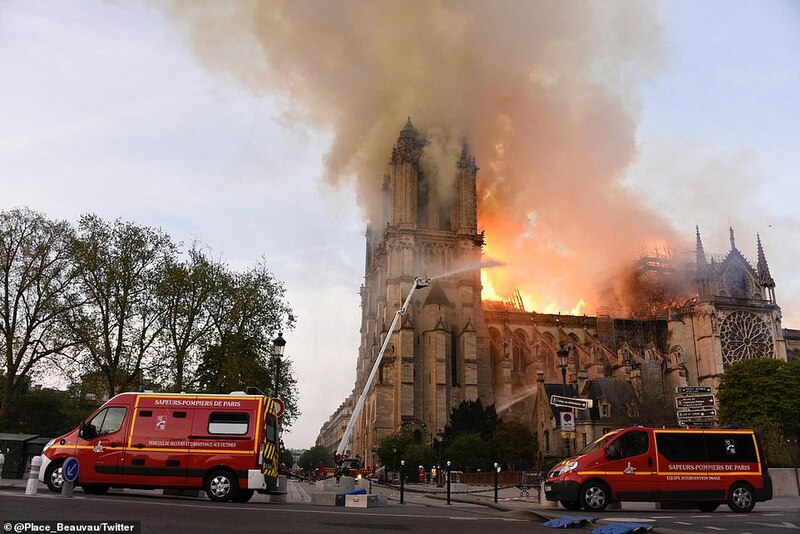 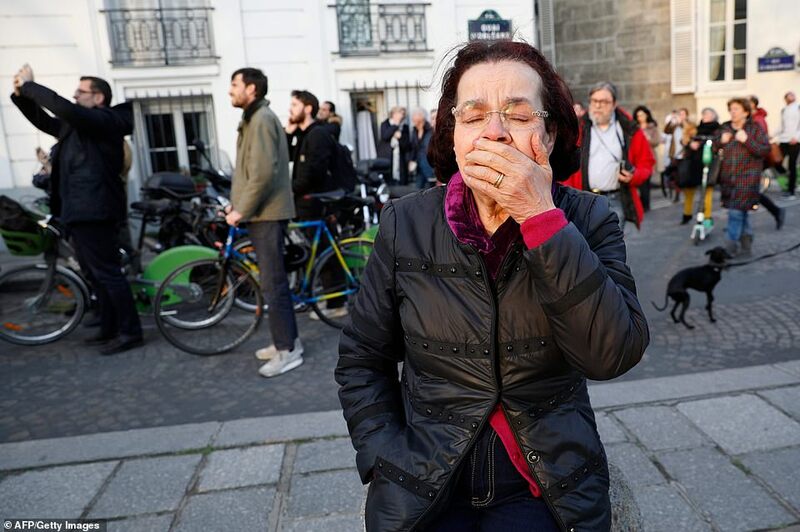 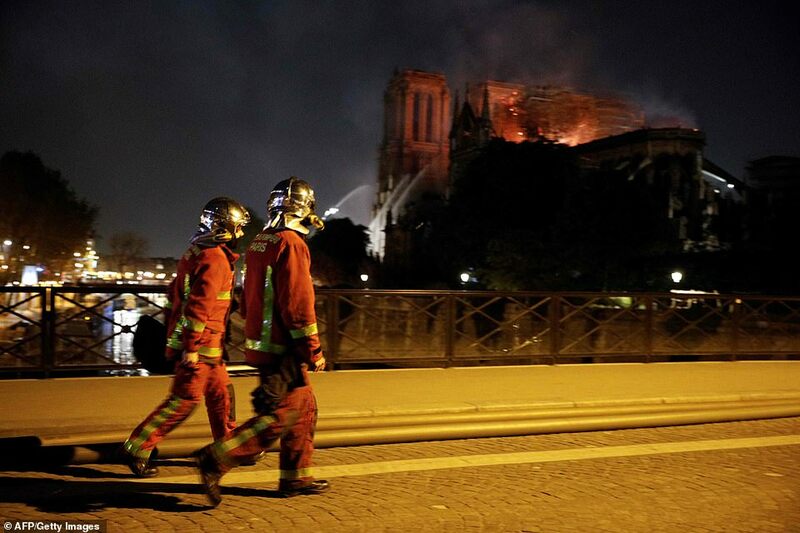 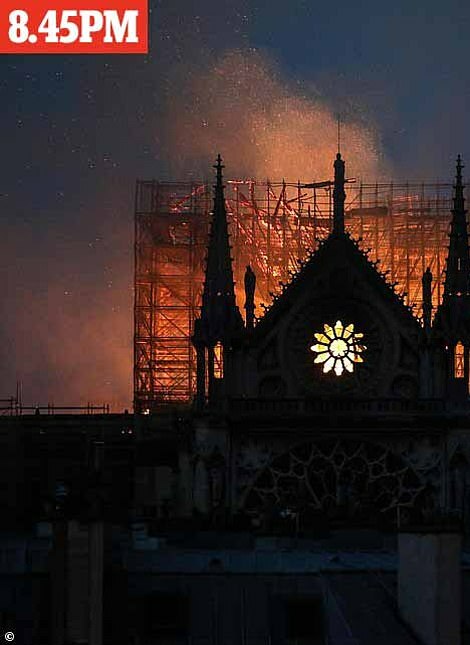 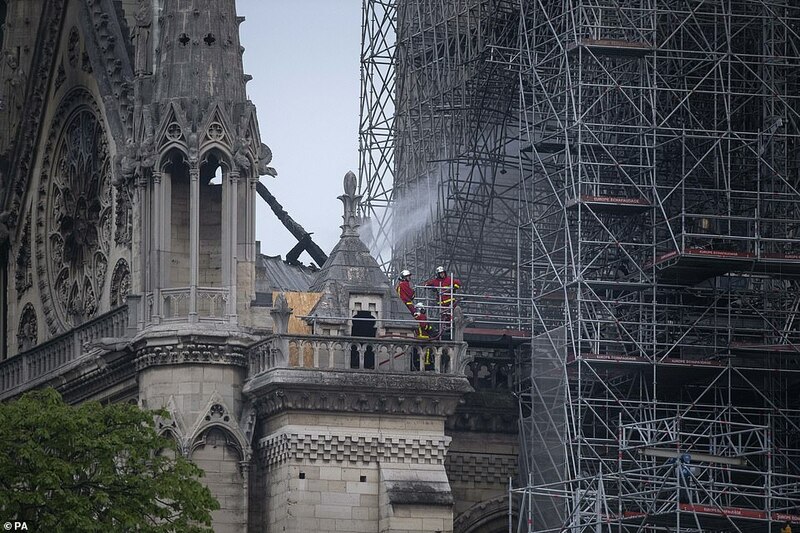 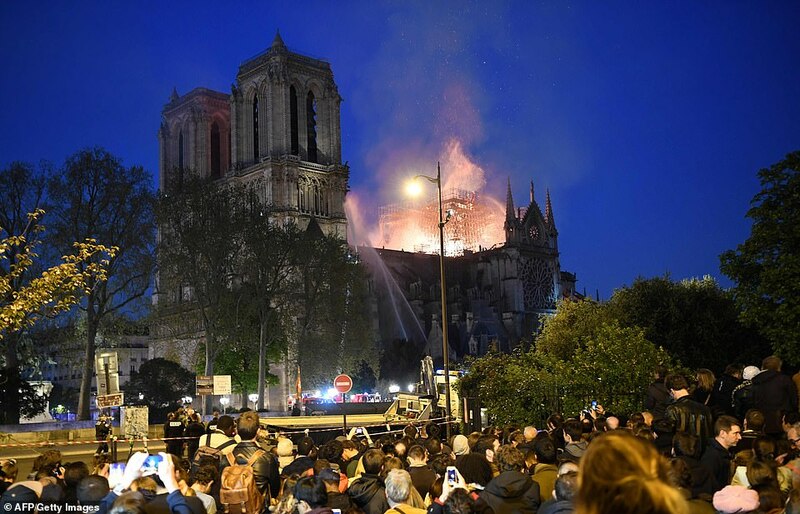 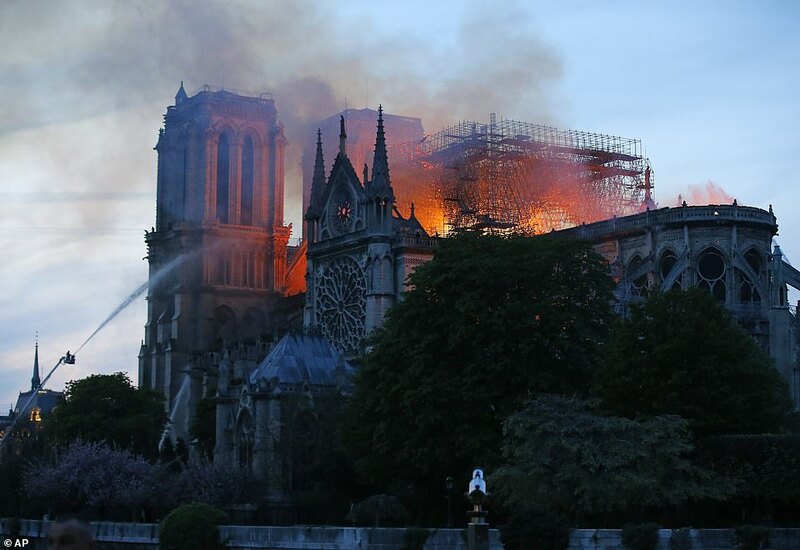 ‘Nothing suggests that it was a voluntary act,’ Remy Heitz told reporters outside the Gothic cathedral, adding that the workers employed at the site were being questioned over Monday’s blaze. 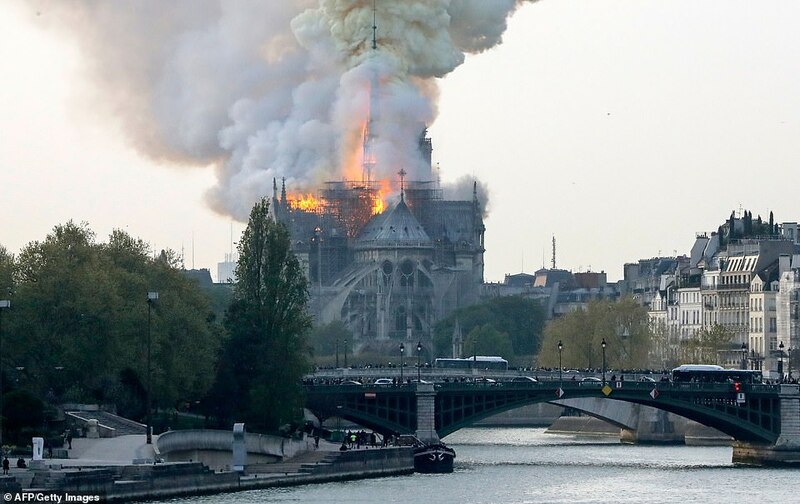 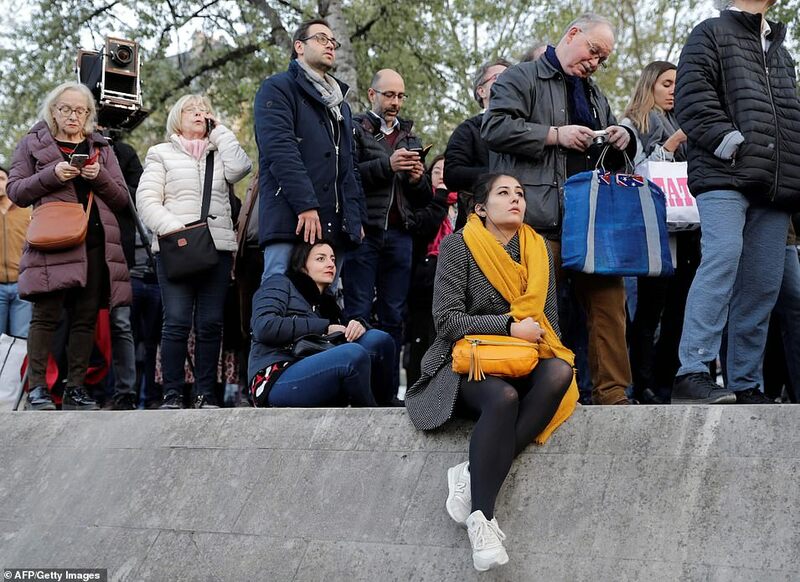 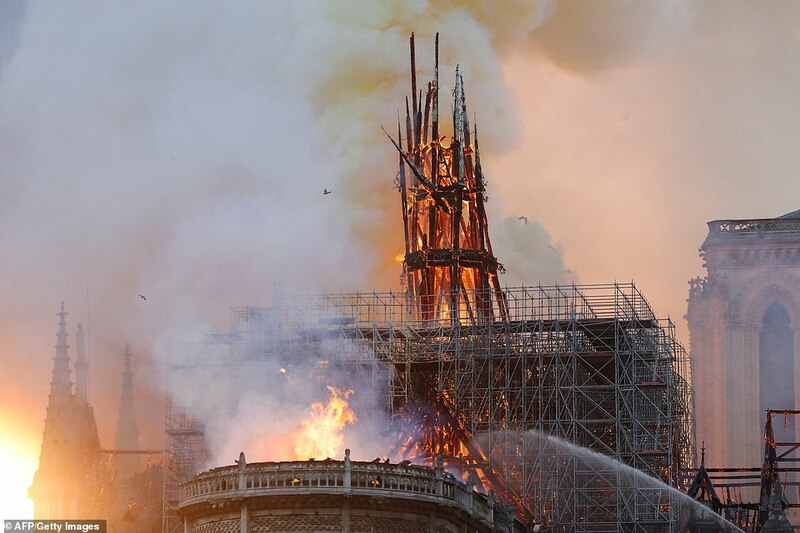 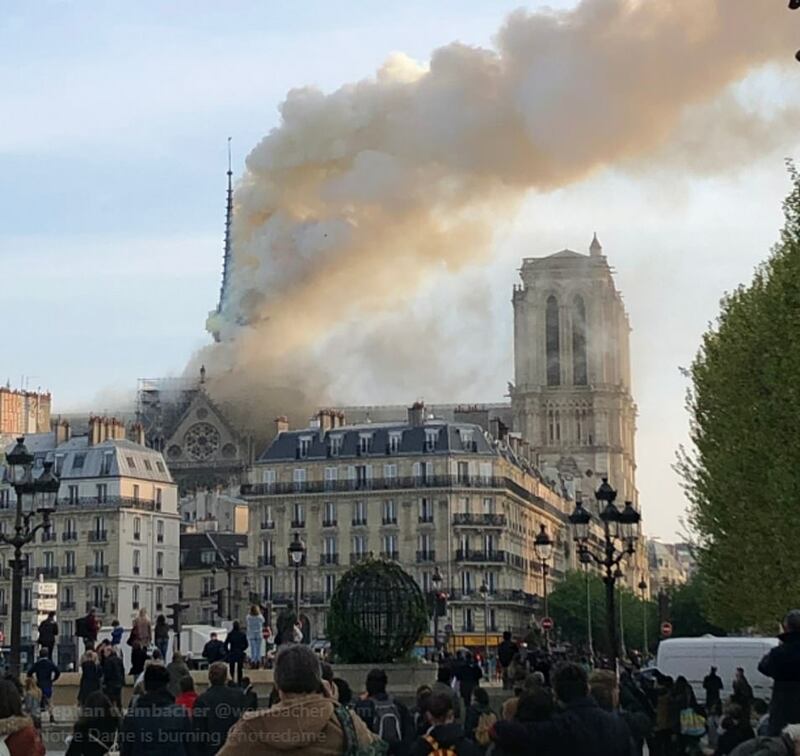 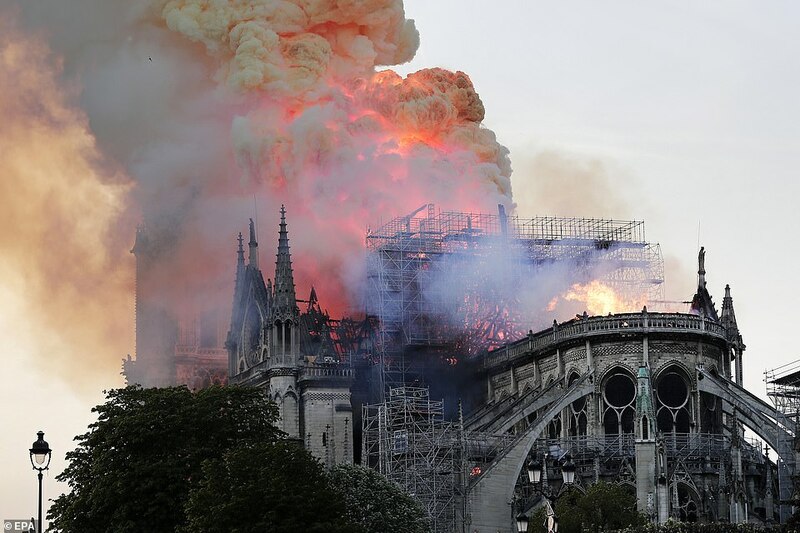 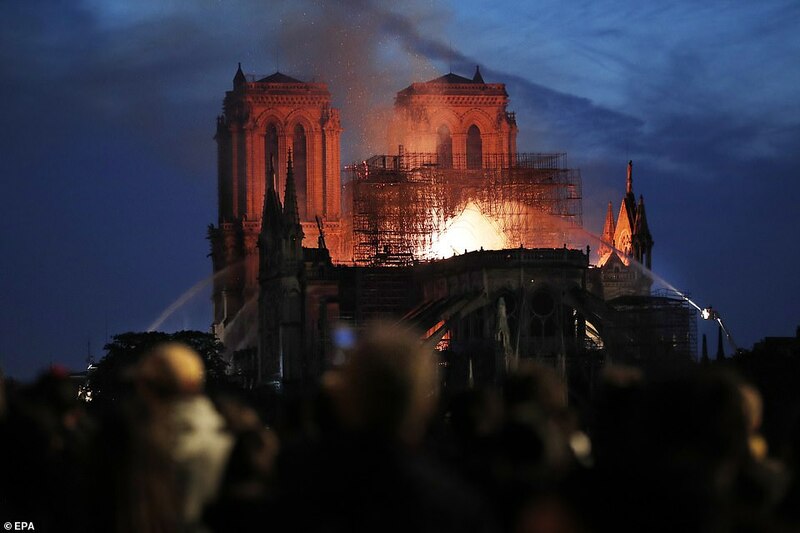 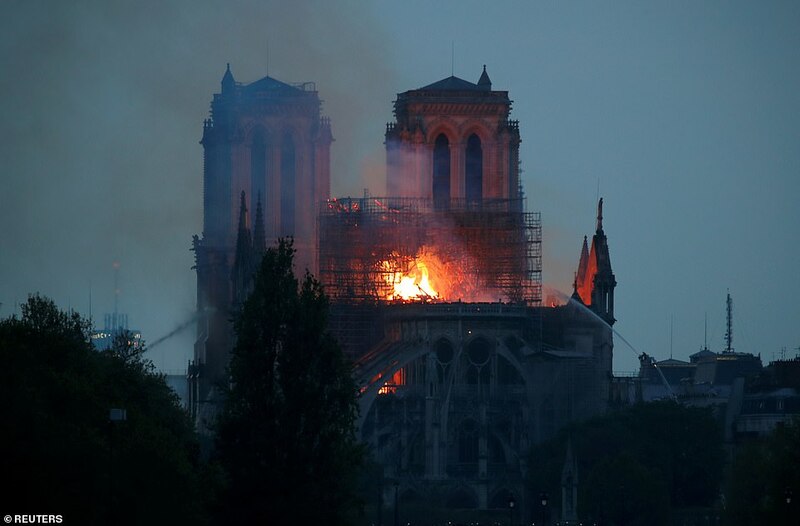 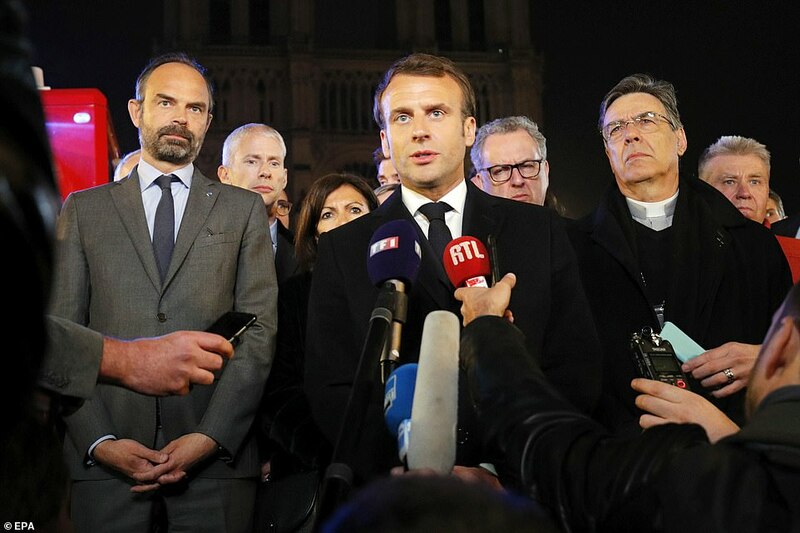 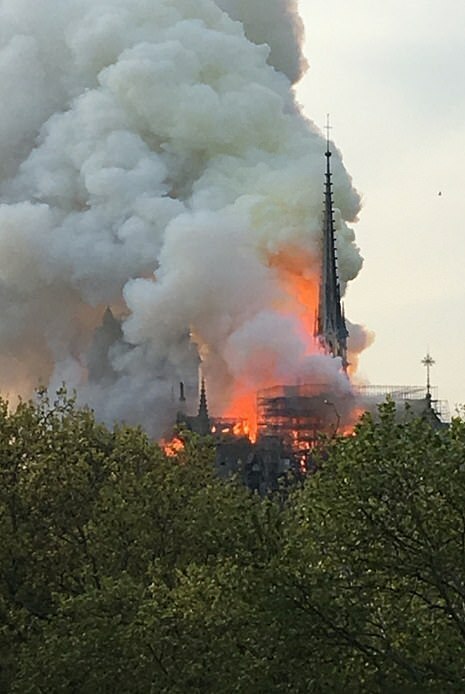 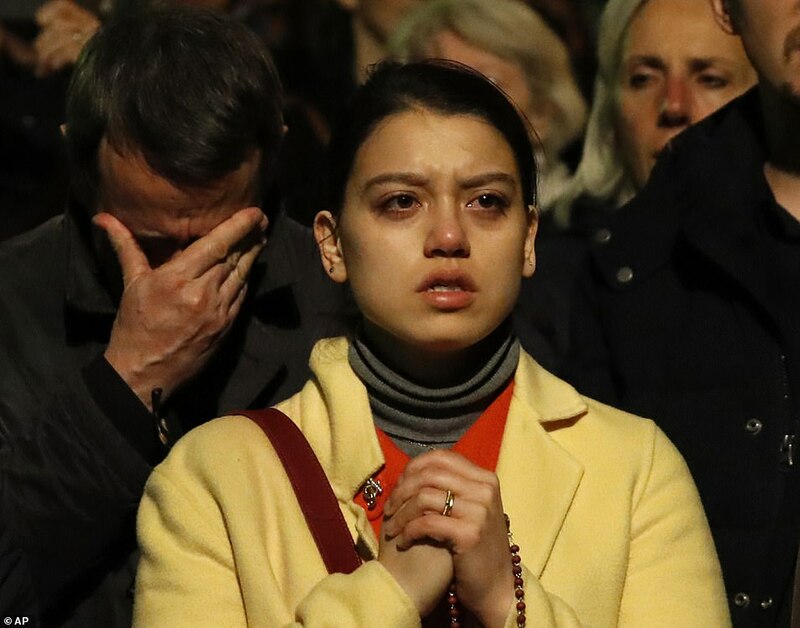 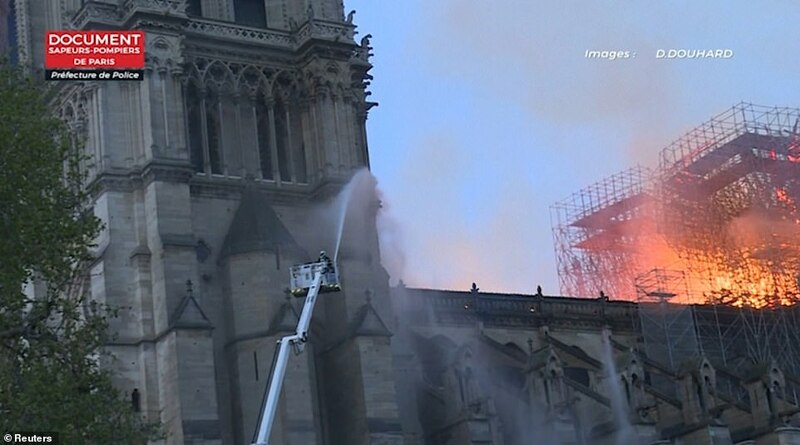 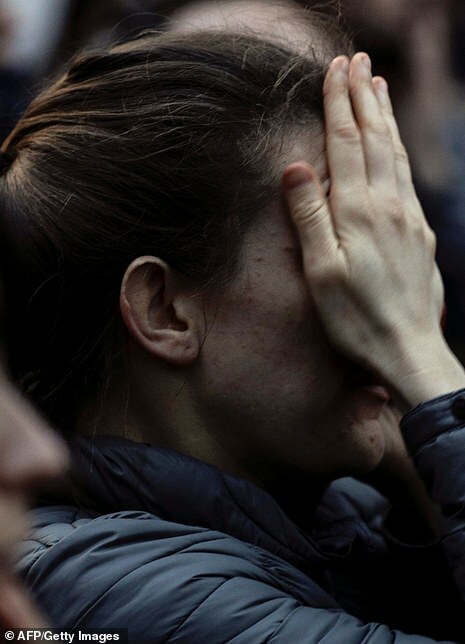 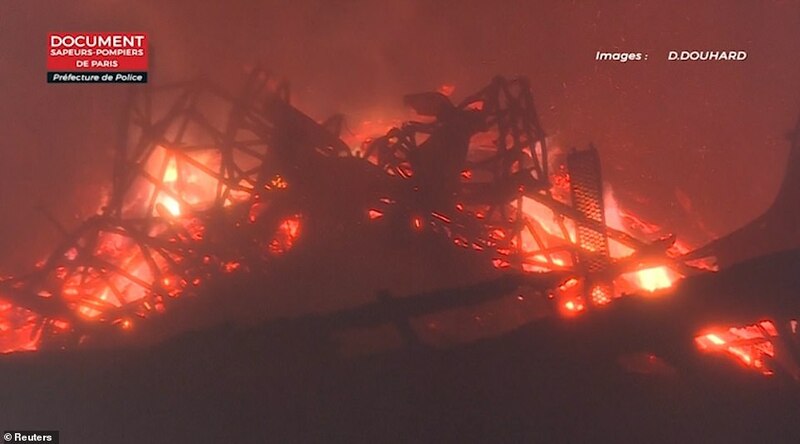 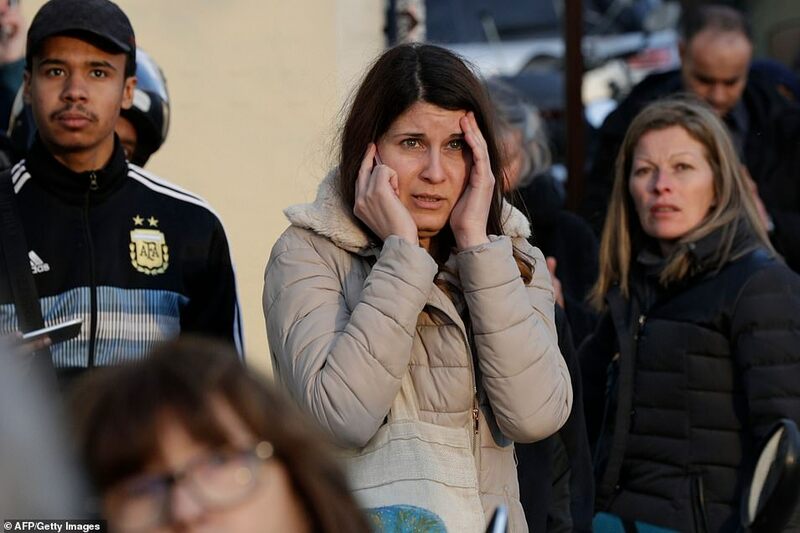 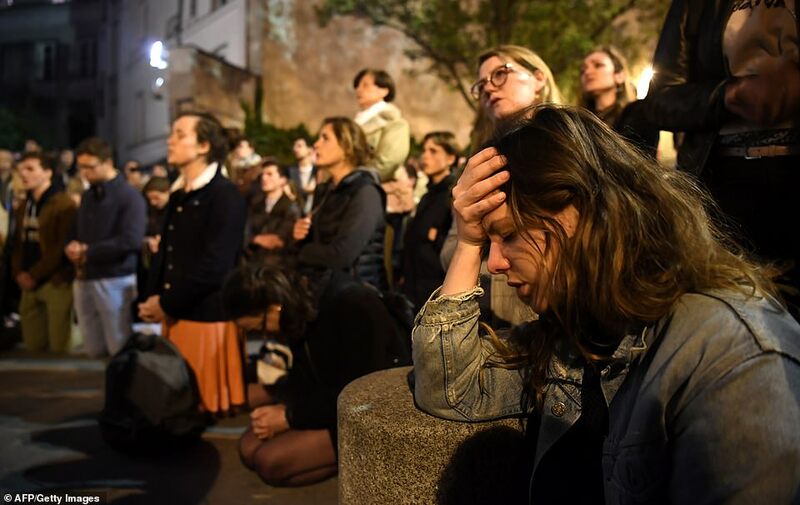 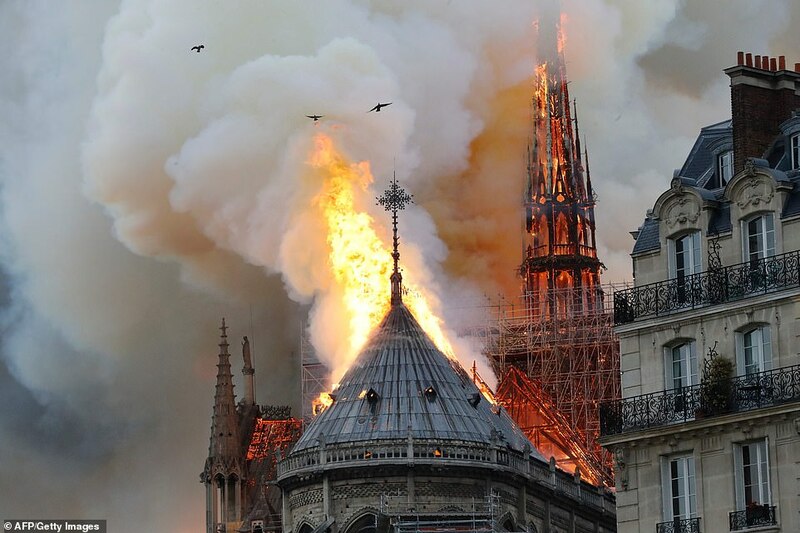 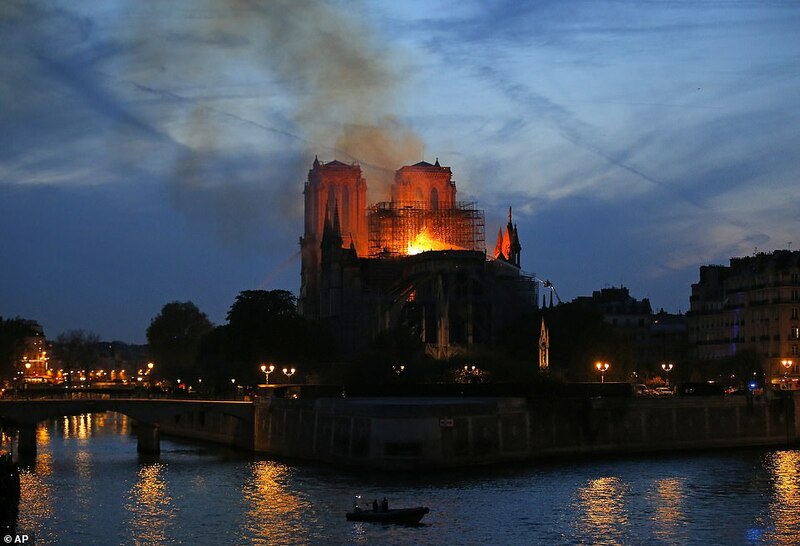 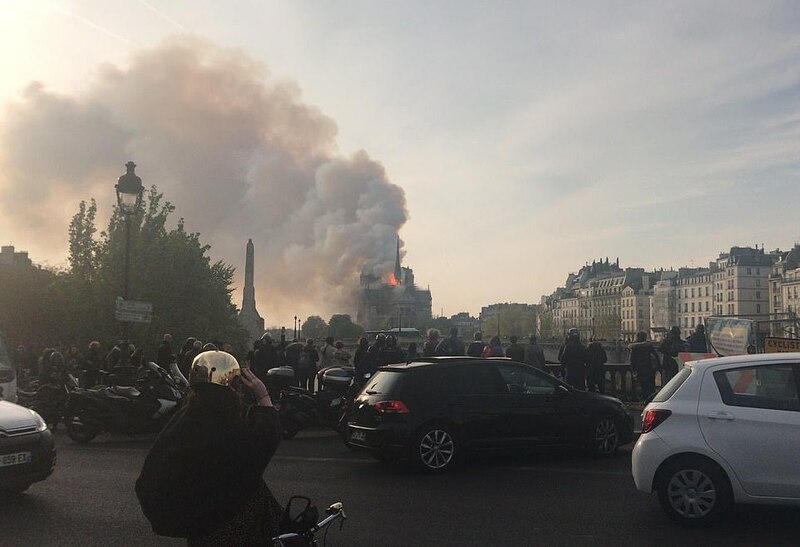 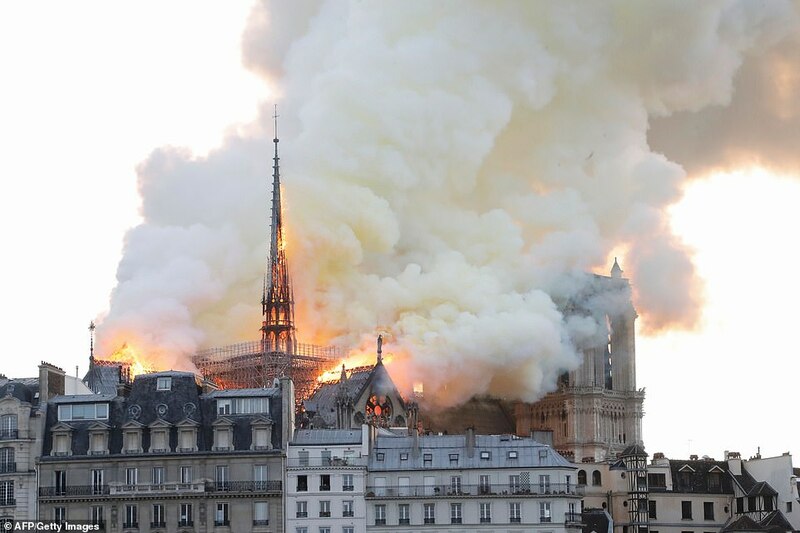 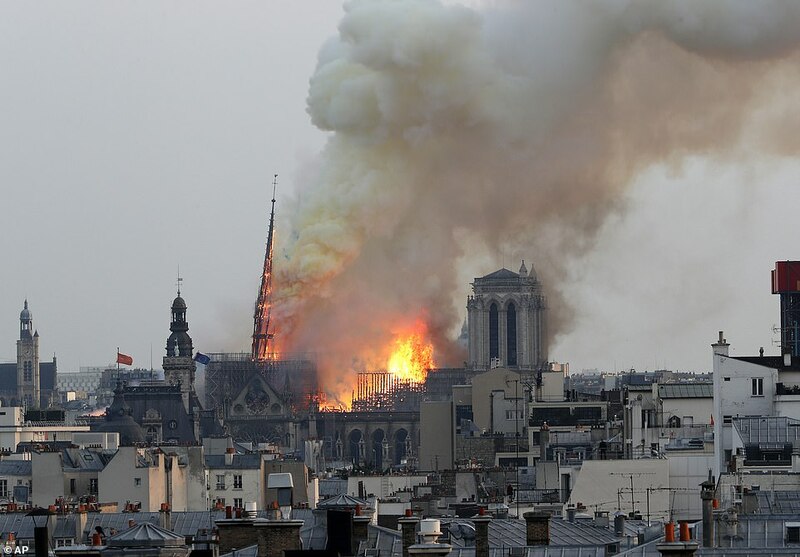 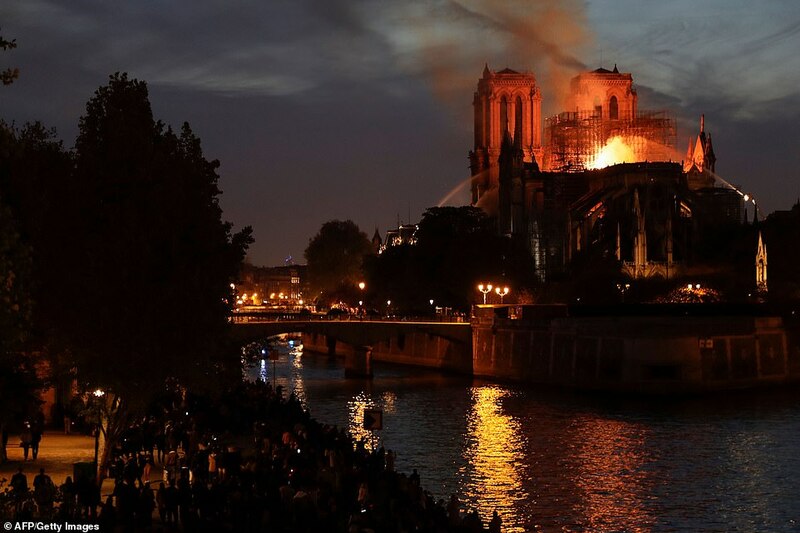 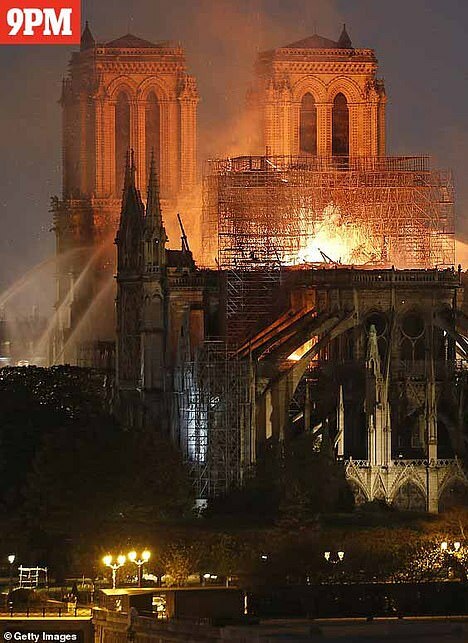 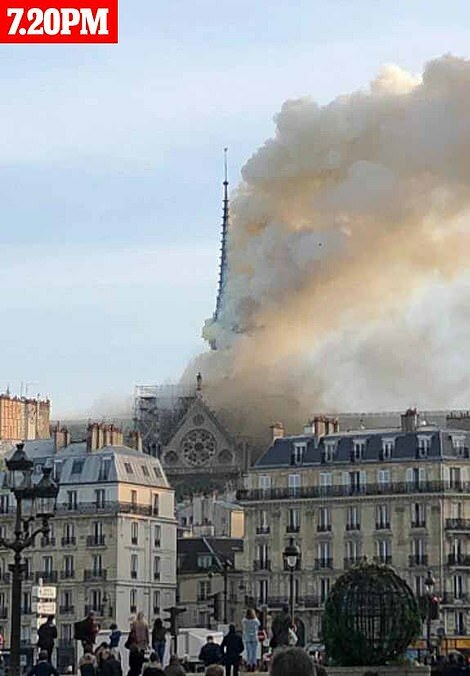 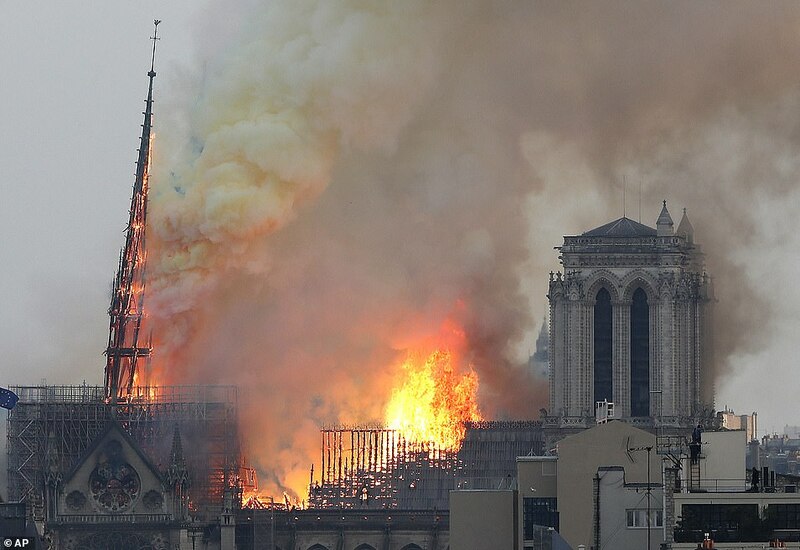 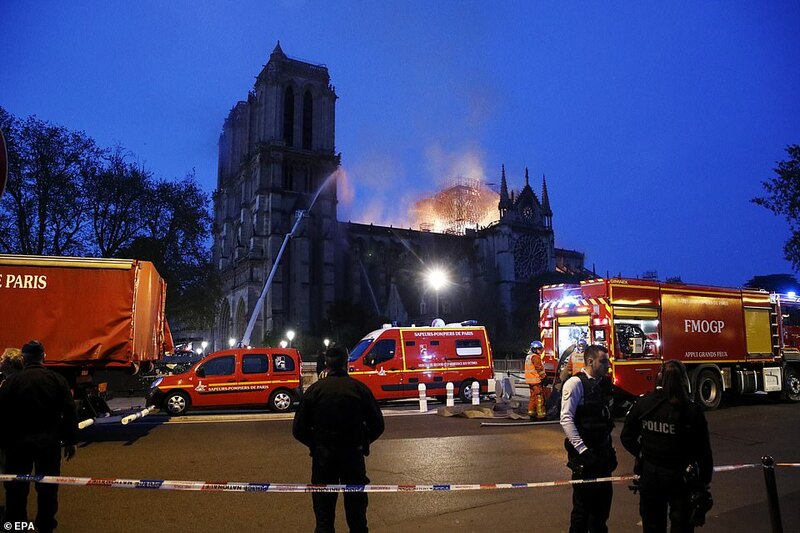 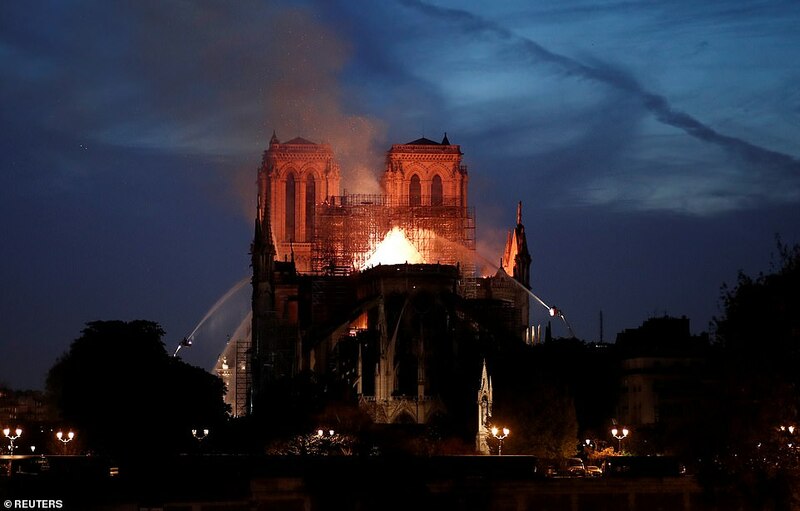 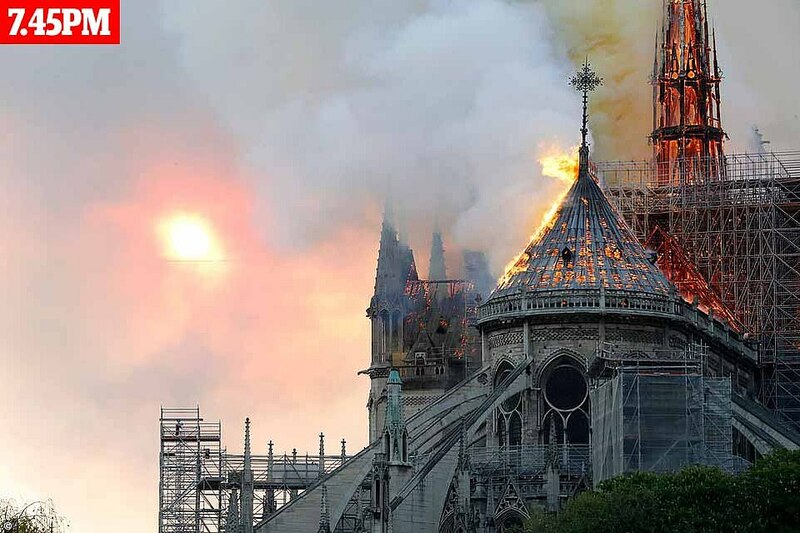 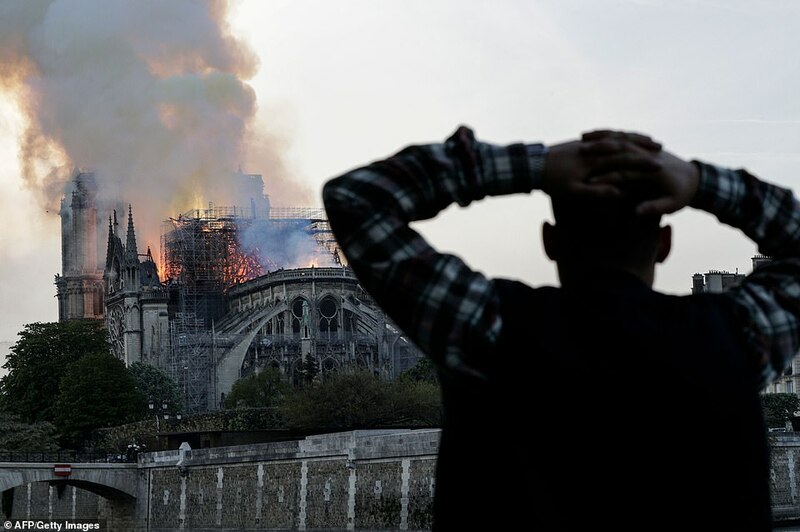 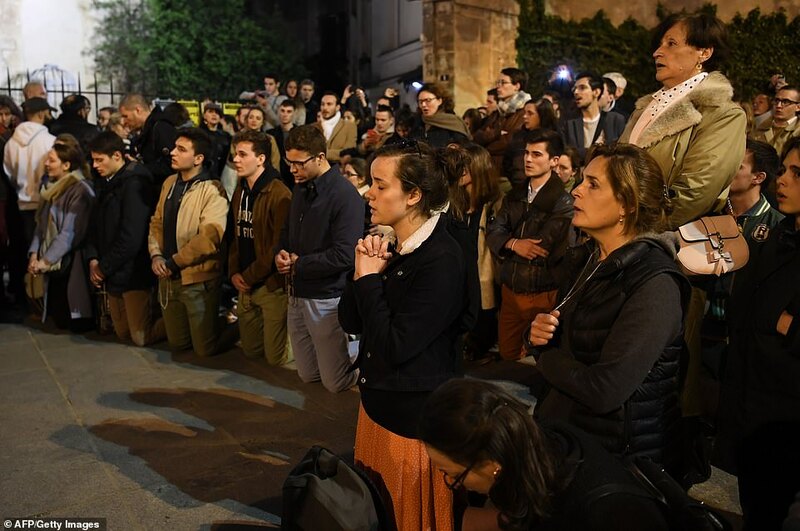 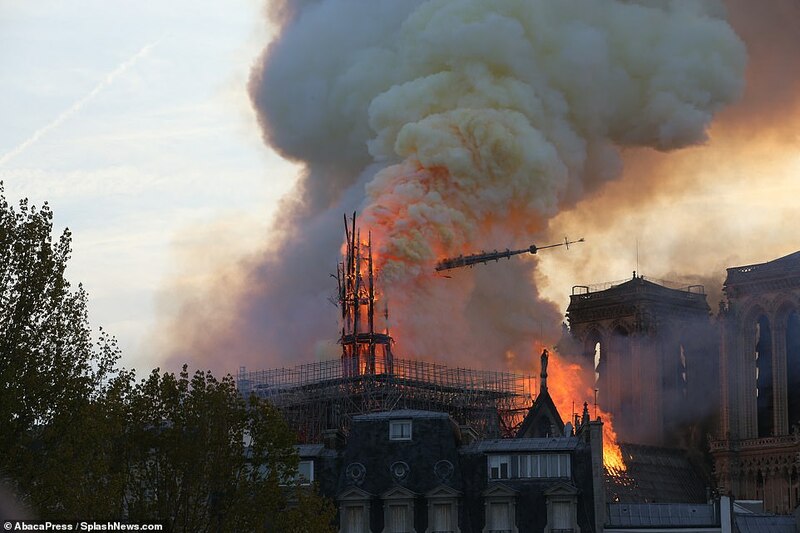 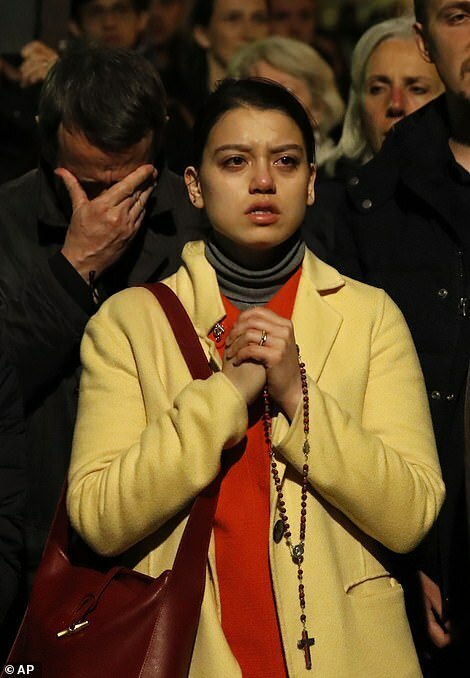 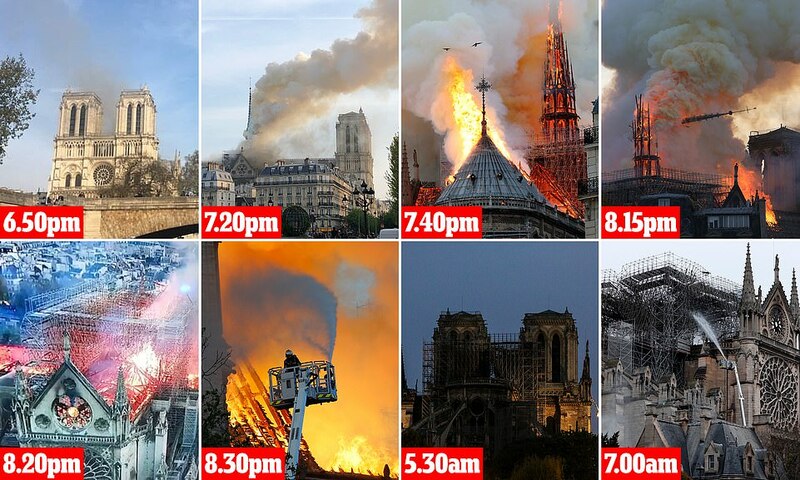 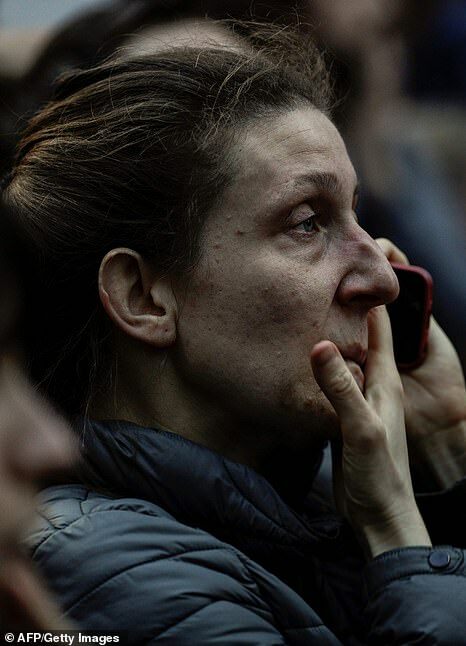 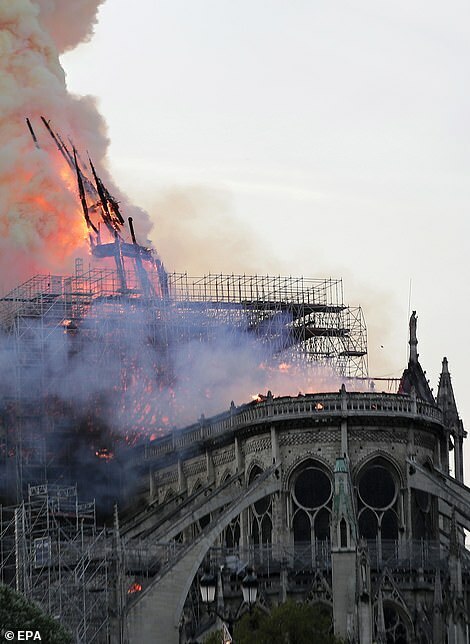 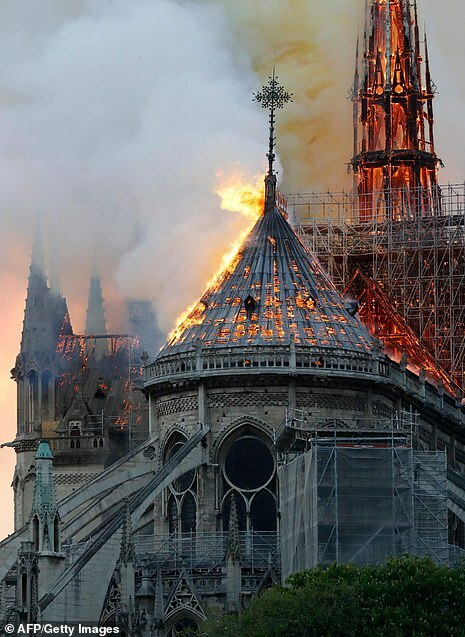 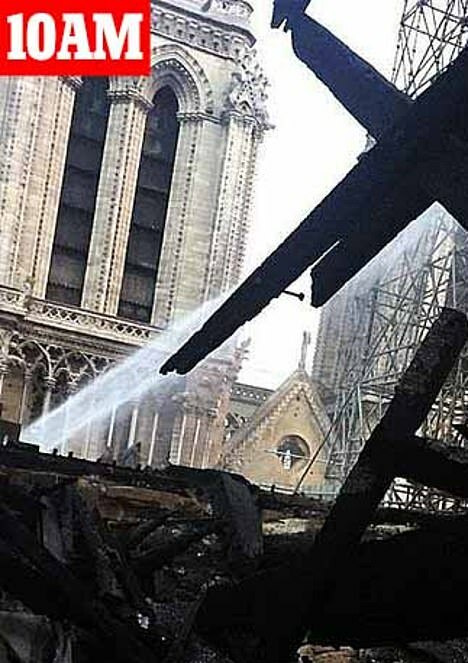 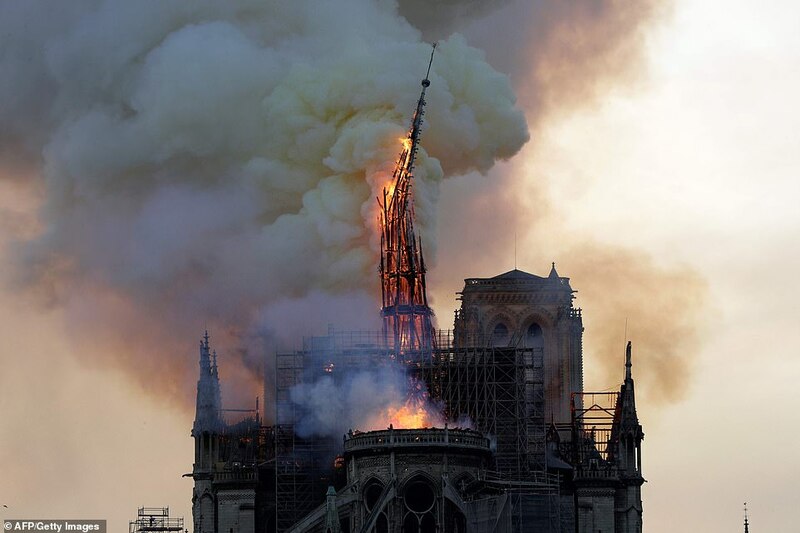 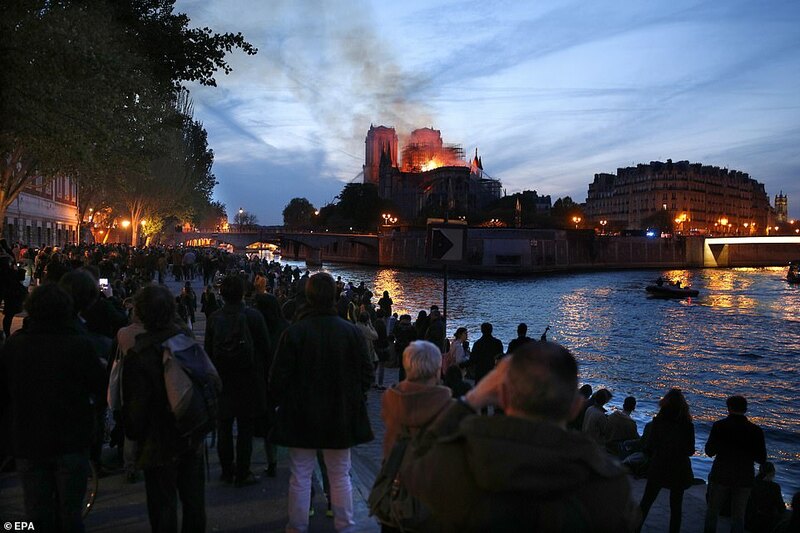 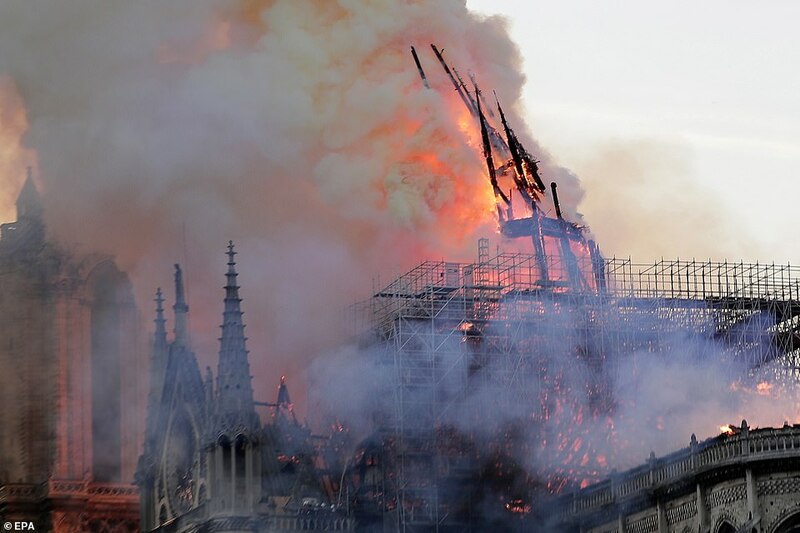 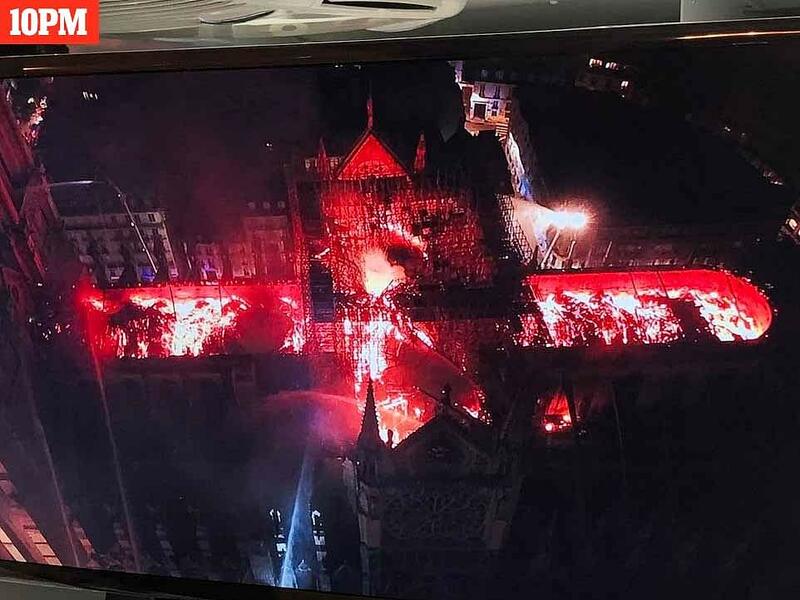 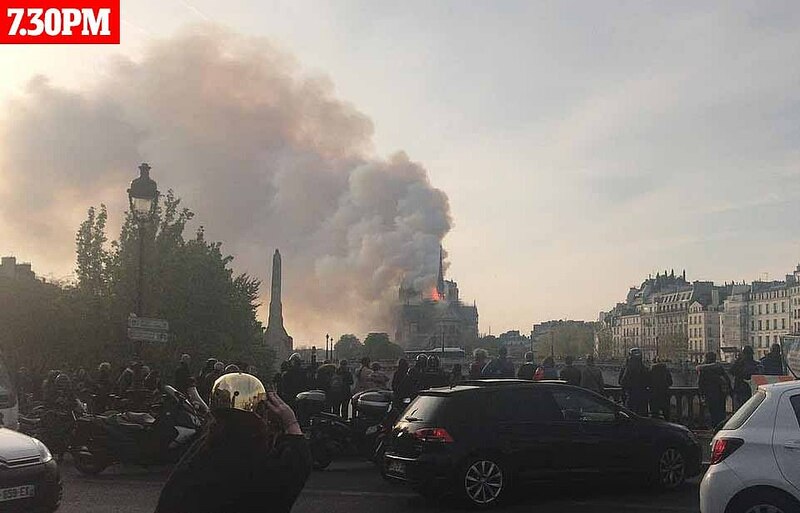 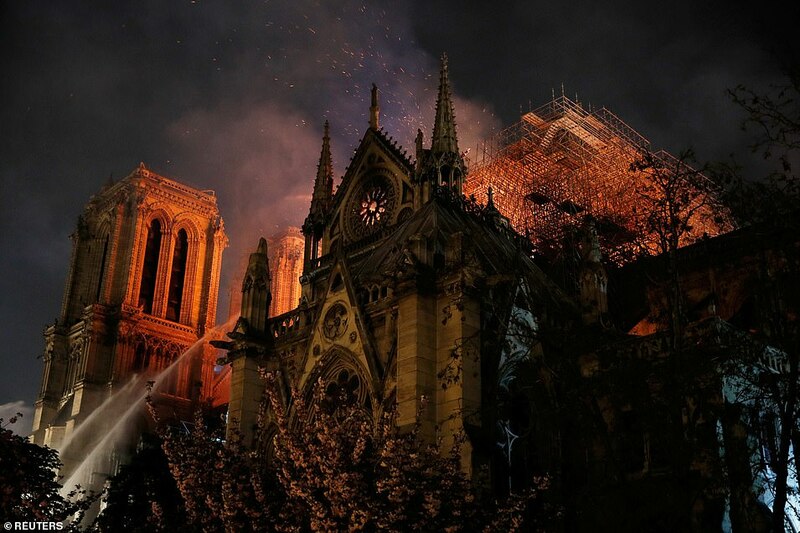 Some of the firm’s 200 specialist employees were working at the site where the fire is thought to have originated, the cathedral’s 300ft-tall wooden and lead spire, which collapsed in front of crowds of horrified Parisians at 8pm. 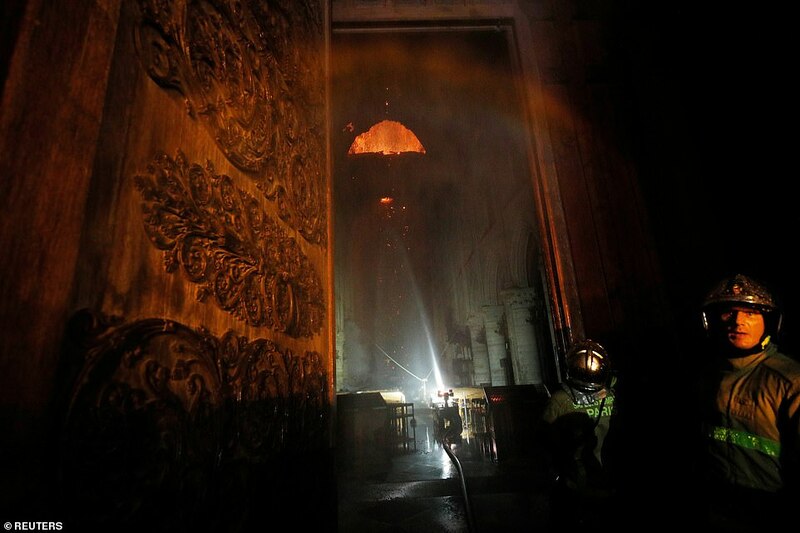 ‘The fear is that a small fire began in the rood where they were working,’ the source added. 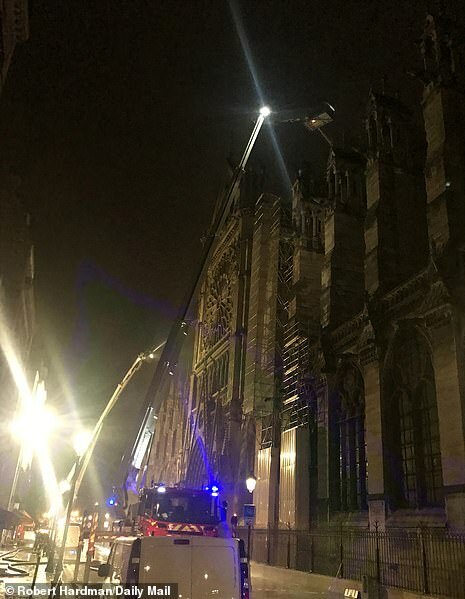 Fears had grown for the ‘really irreplaceable’ stained-glass windows, dating back to the 13th century, amid the heat of the fire last night. 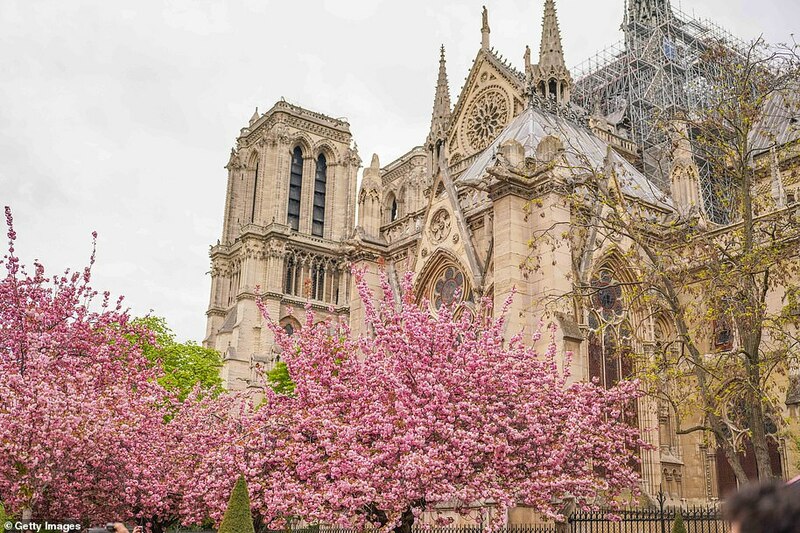 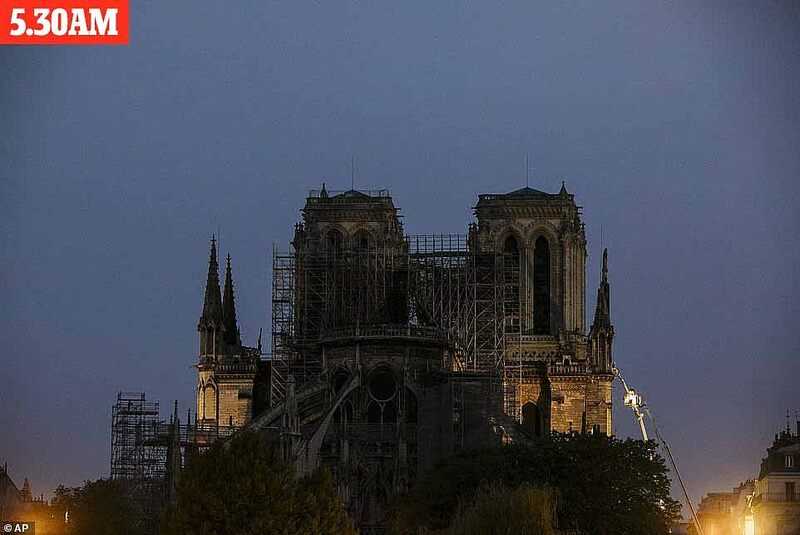 ‘I hope the Notre-Dame cathedral may once again become, thanks to reconstruction work and the mobilization of all, a jewel in the heart of the city,’ Francis said in a statement issued by the Vatican. 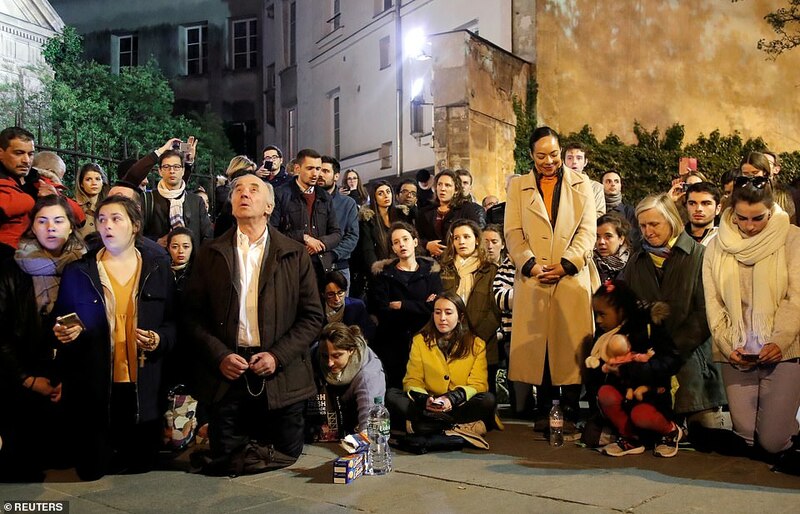 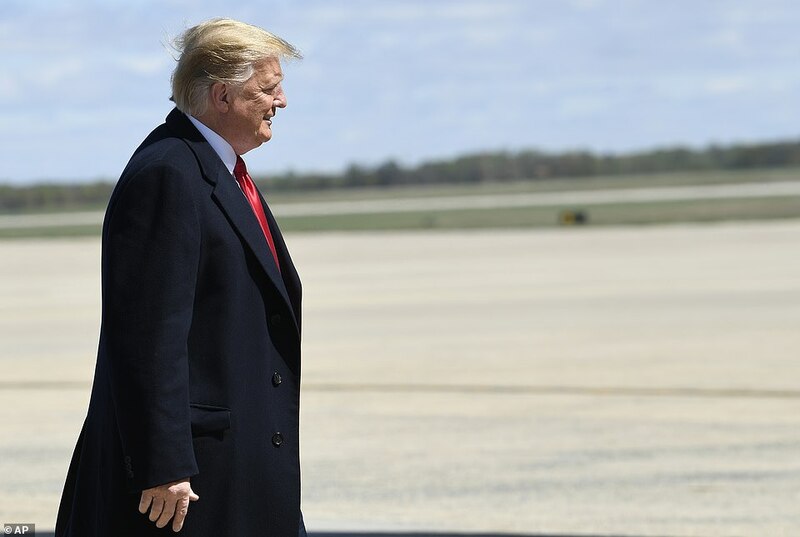 Leaders from around the world offered their condolences to France. 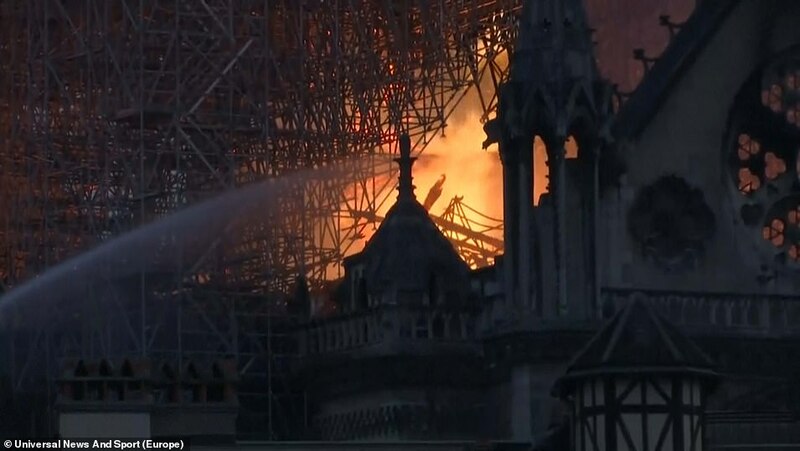 Among them was Queen Elizabeth II, who said: ‘Prince Philip and I have been deeply saddened to see the images of the fire which has engulfed Notre-Dame Cathedral. 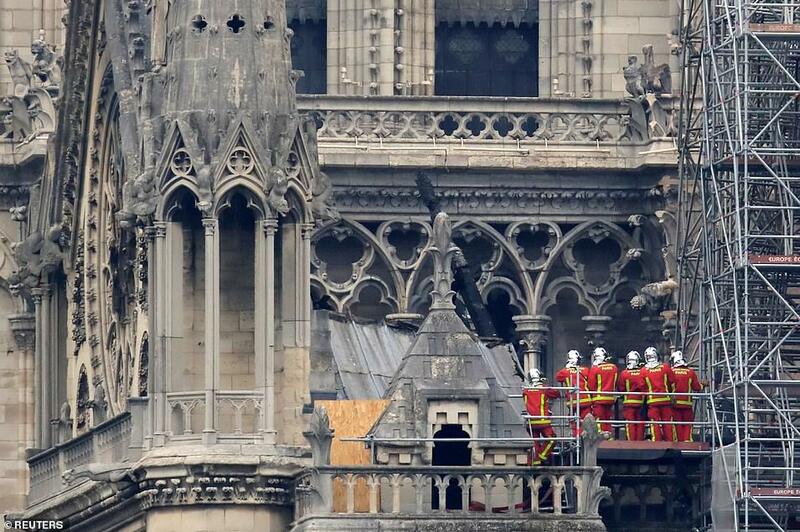 ‘I extend my sincere admiration to the emergency services who have risked their lives to try to save this important national monument. 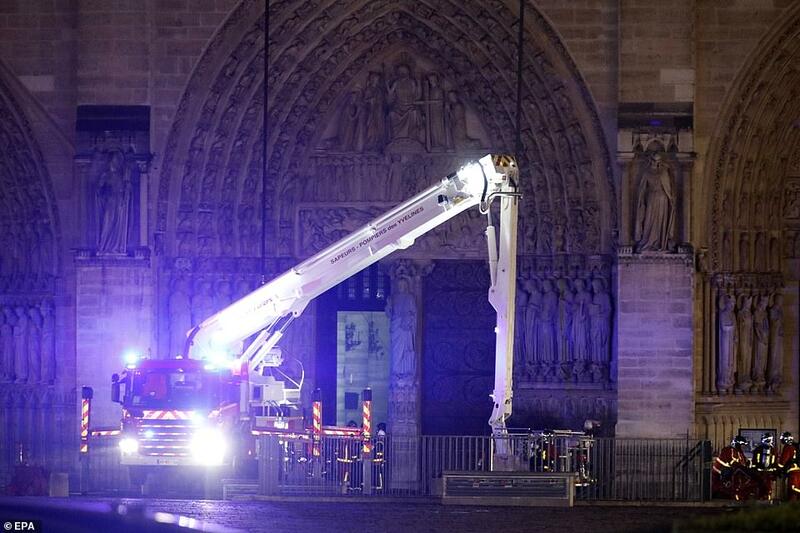 Police have made clear today that they believe Monday night’s fire was an accident. 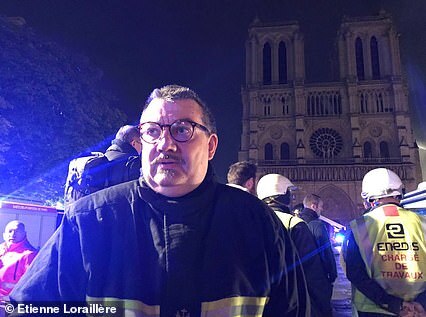 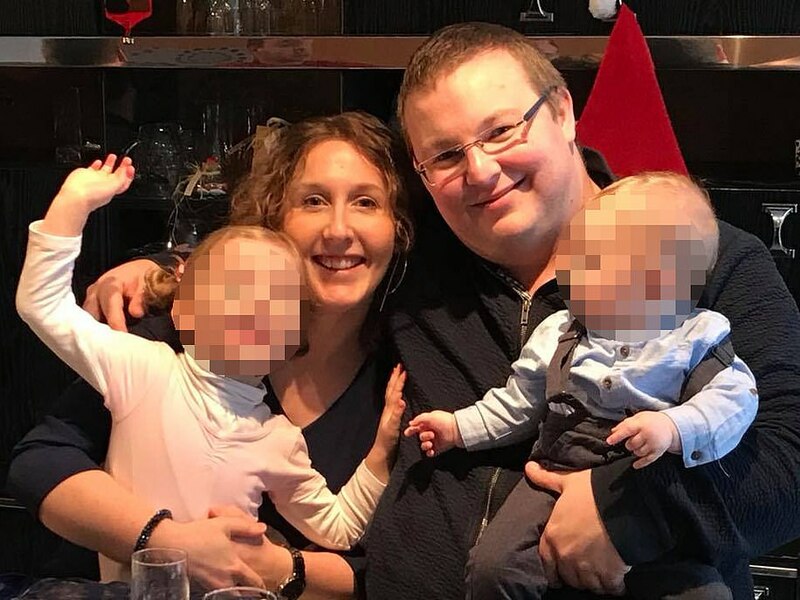 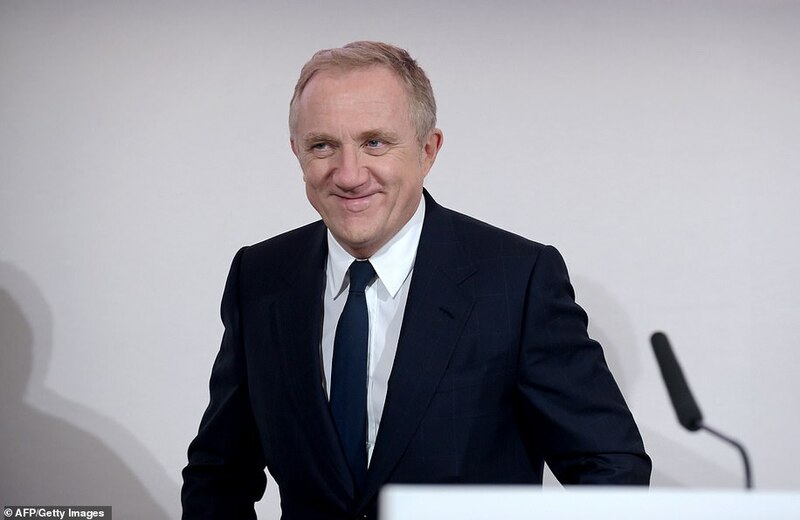 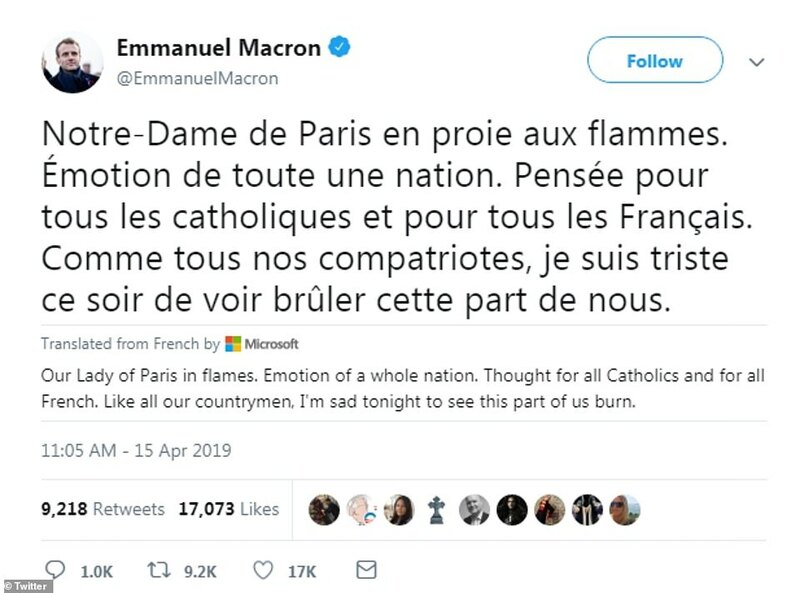 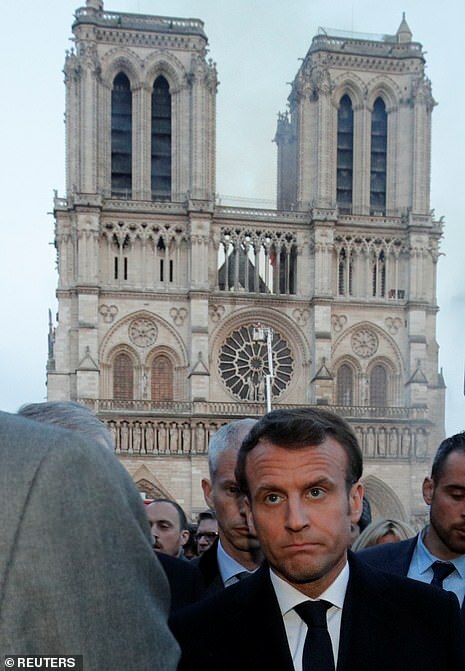 The construction boss whose firm was renovating Notre Dame before the fire broke out has previously boasted about his firm’s ability to protect historic sites, MailOnline can reveal. 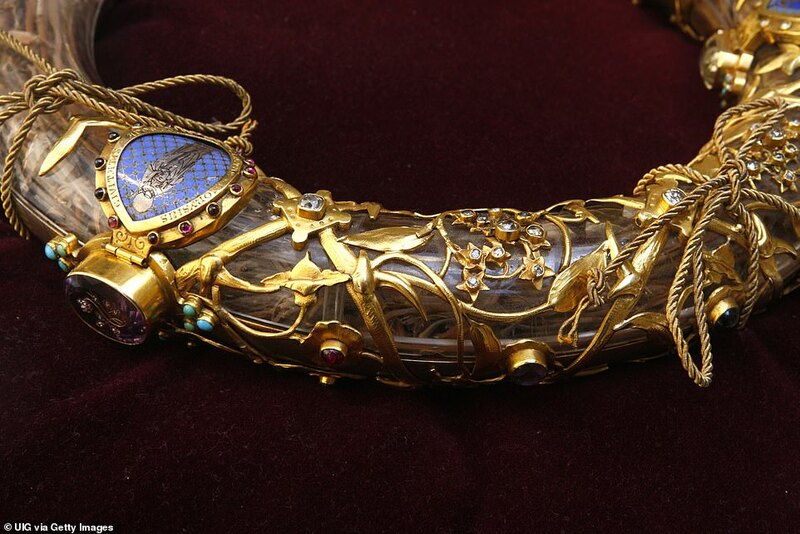 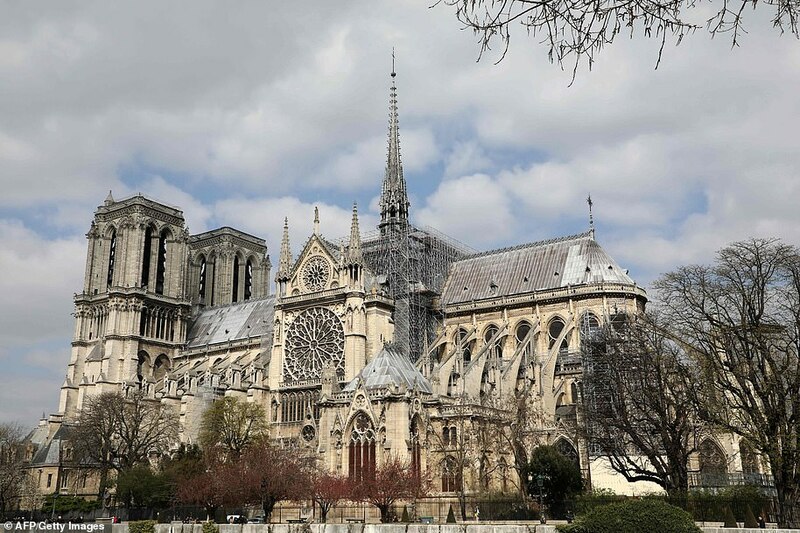 His company, Le Bras Freres, a small company known as the ‘Cathedral Restorers’, had won the £5million contract to repair the spire of the Paris landmark. 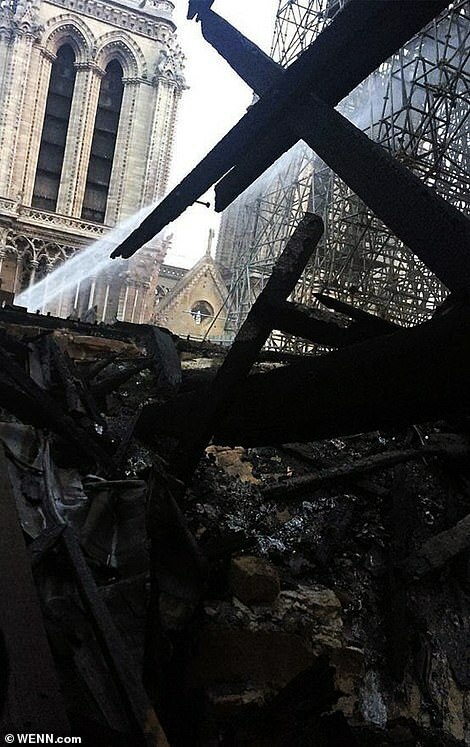 Today craftsmen from the company were being questioned by investigators after the spire came crashing down in Monday night’s horrific blaze. 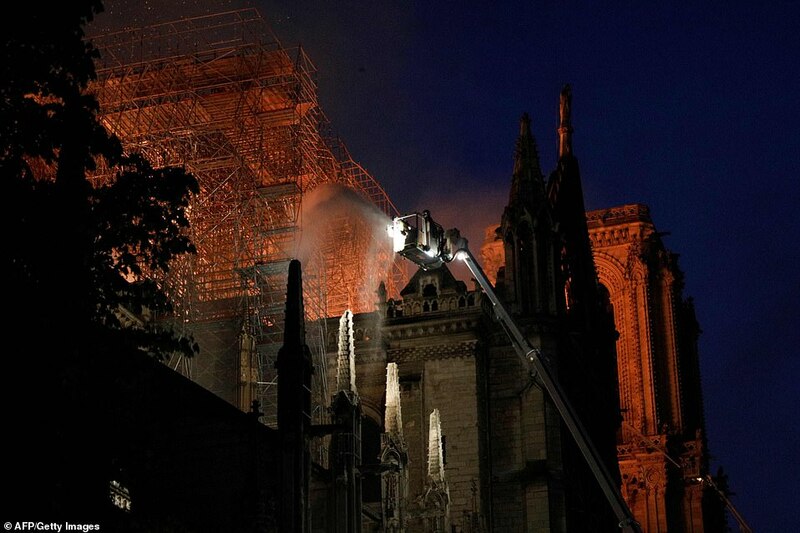 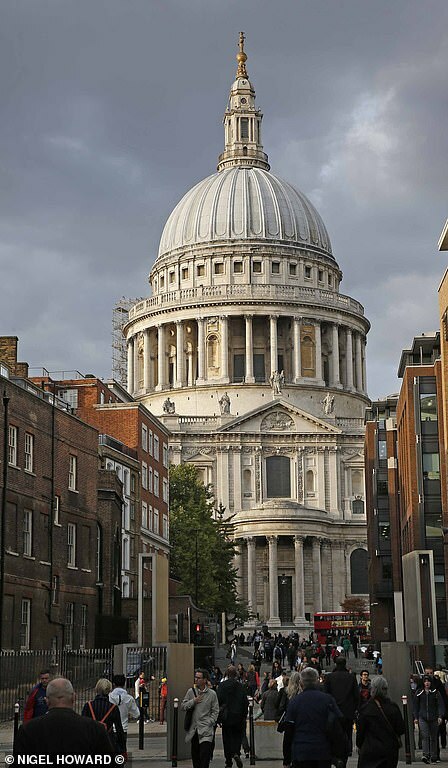 The 32-year-old construction boss had previously heralded his firm’s ‘technical ability and competence’ and ‘pride’ in restoring historic buildings. 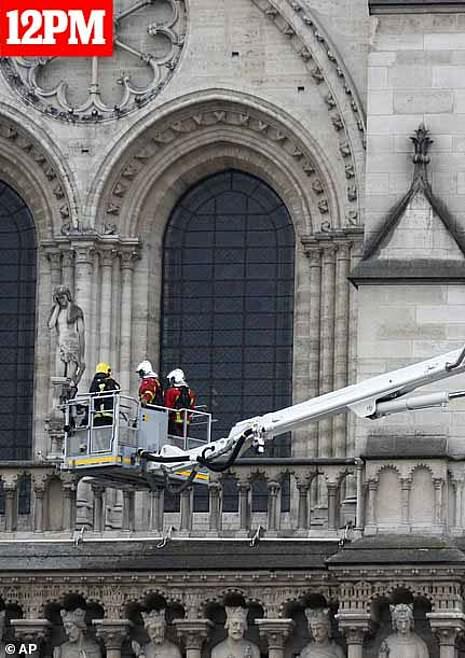 In a film posted online, Mr Le Bras said: ‘We are proud of our work on historic buildings. 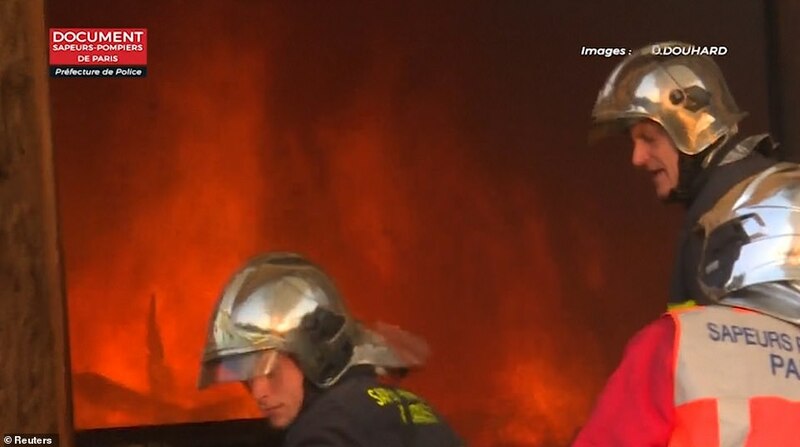 We have the technical ability and the competence for his work. 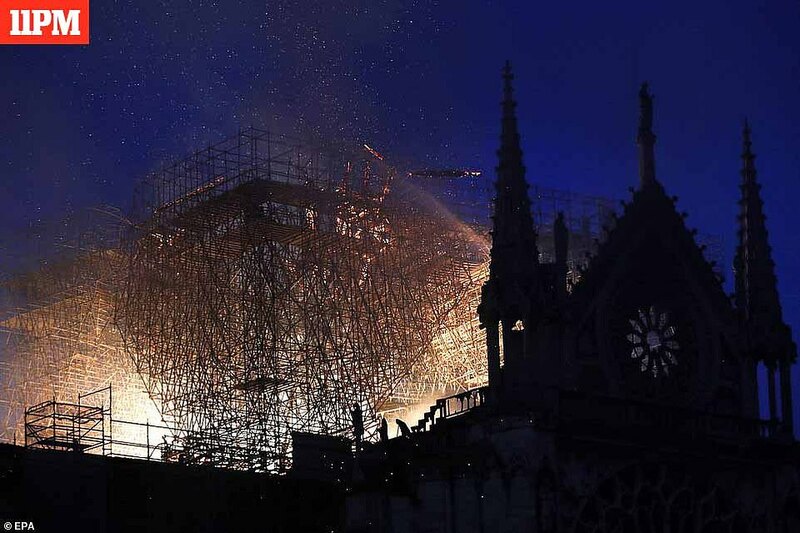 In the video posted on the Le Bras Freres Facebook page on New Year’s Eve 2018 the CEO says his firm is proud to have been chosen to work on buildings across France, including the ‘Congress Palace’ in Metz and Notre Dame in Paris. 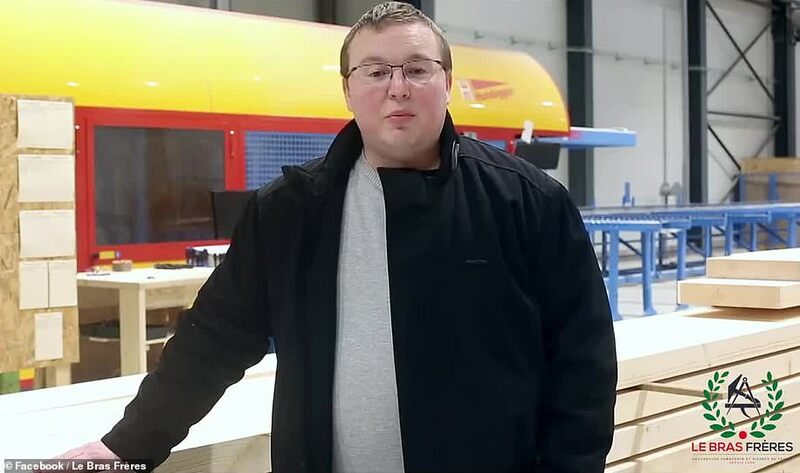 Filmed at the staff end-of-year party Le Bras said: ‘We are completely ready to start work in 2019 and we are very well motivated. 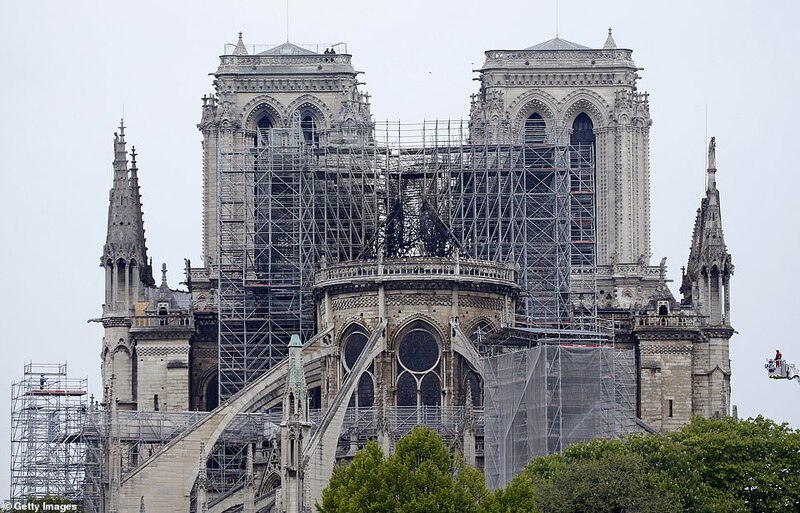 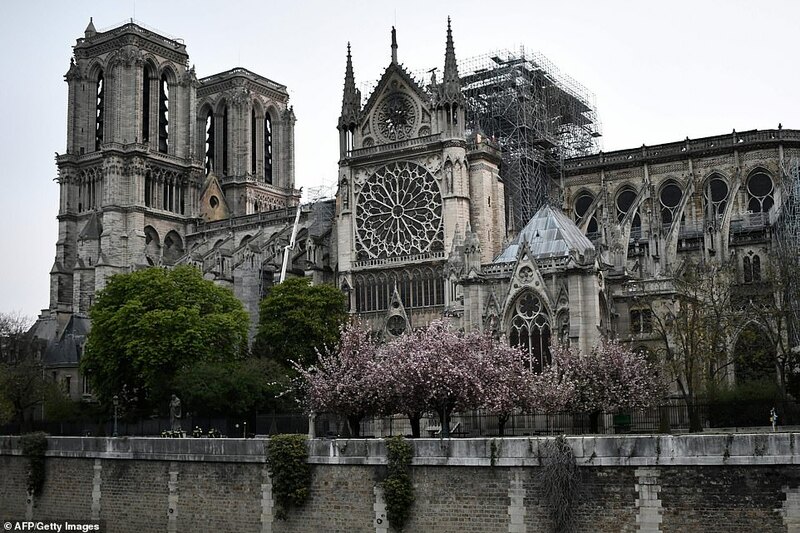 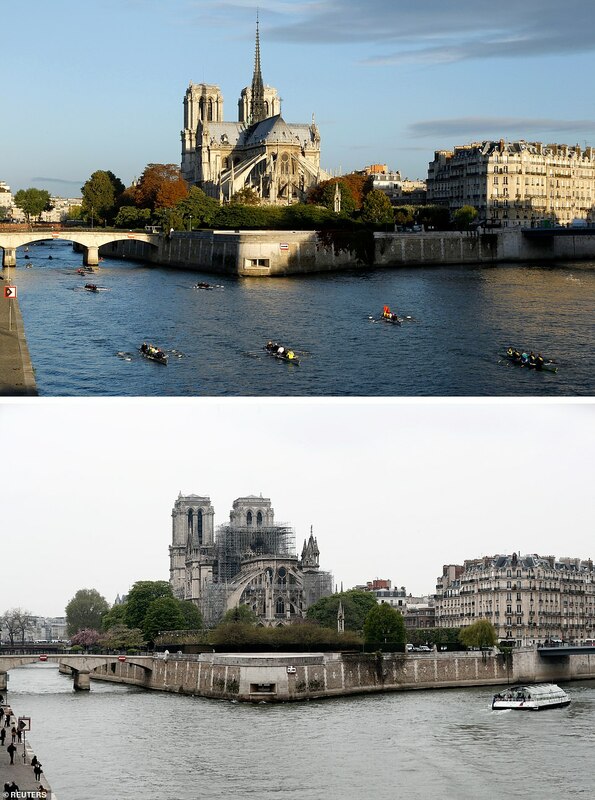 Le Bras said he would ensure that Notre Dame’s famous spire – known in French as la fleche – would not be damaged during the renovation work. 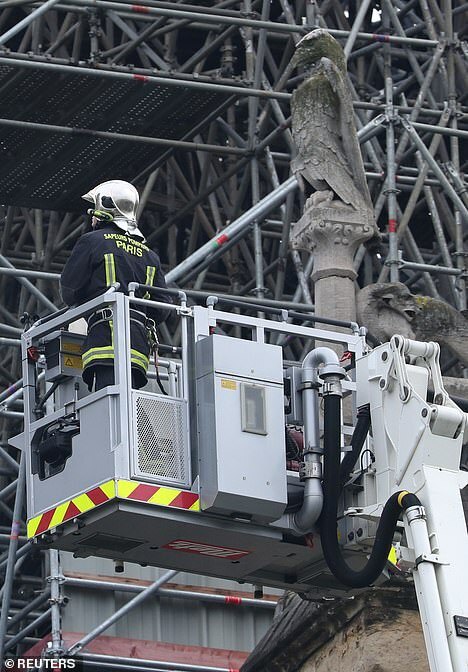 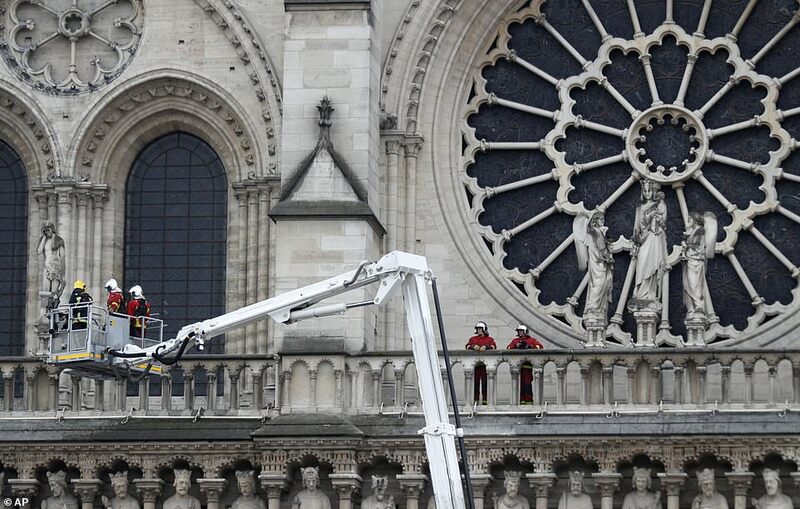 After winning the contract Le Bras said: ‘No one has touched it [Notre Dame] for 150 years, it’s a great honour to be doing the work. 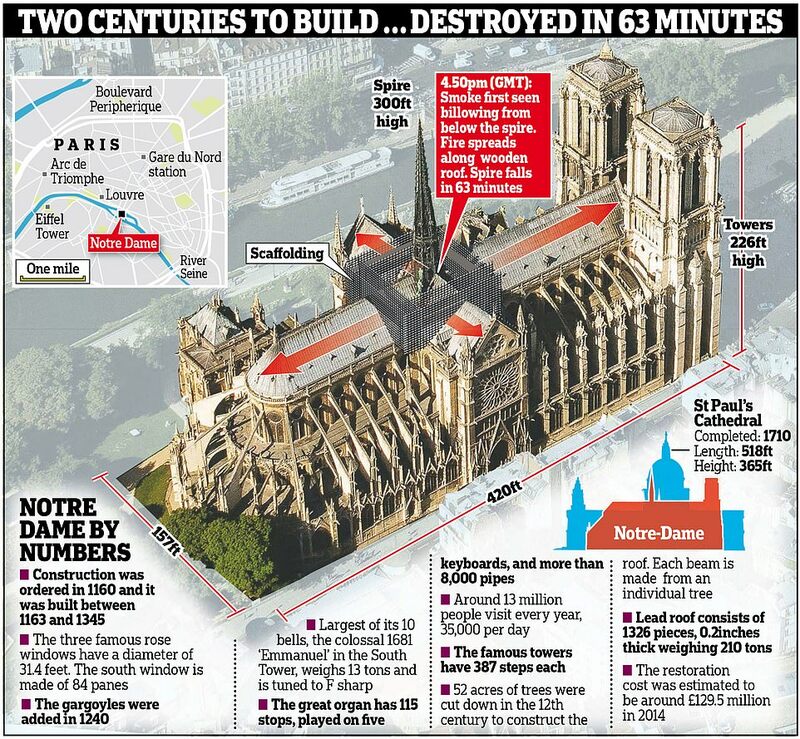 ‘We are not expecting our work to last ten years but we are aiming it to last for another 150 years!’ he joked. 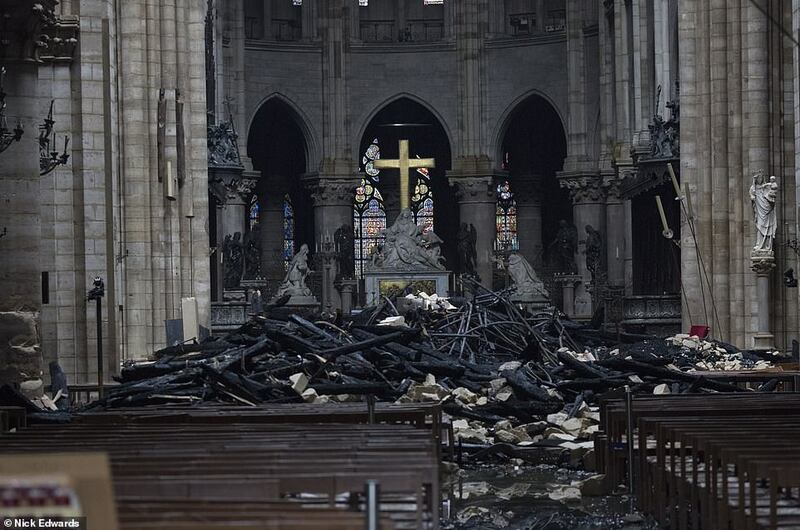 ‘It’s a symbol of our country that risked being destroyed,’ Culture Minister Franck Riester said. 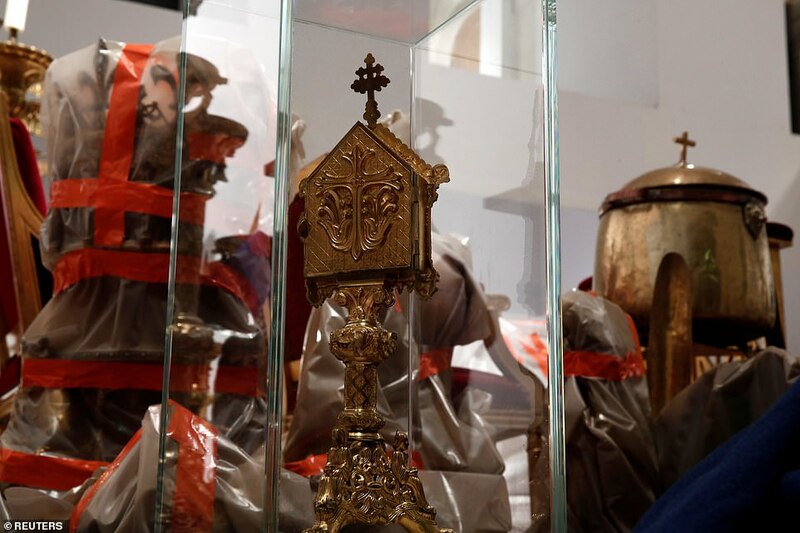 ‘We are used to thinking about them as eternal simply because they have been there for centuries, or a thousand years, but the reality is they are very fragile,’ Violini said. 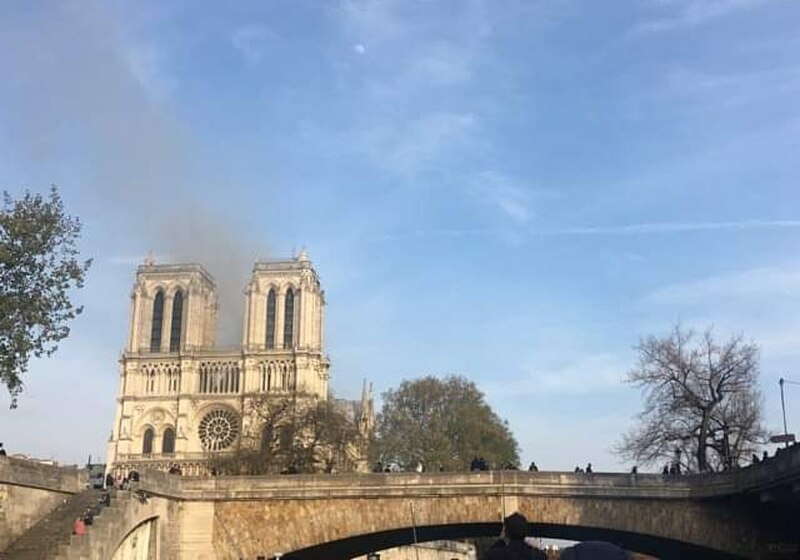 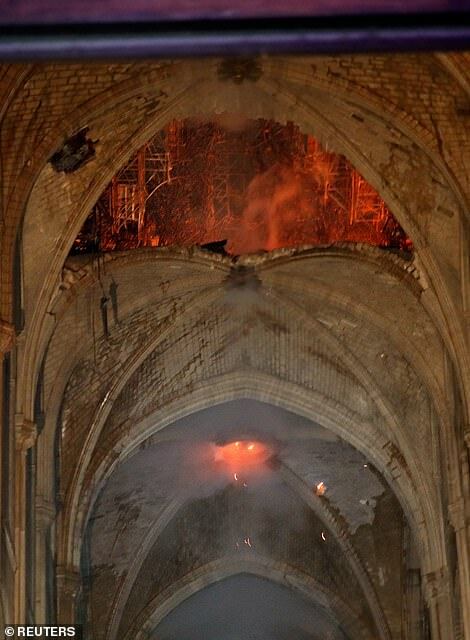 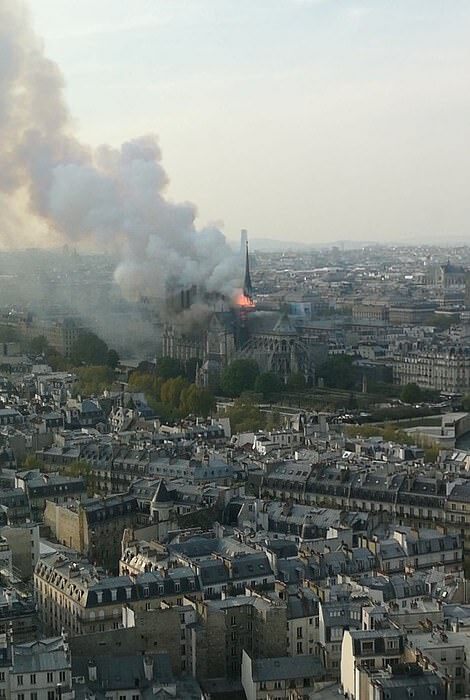 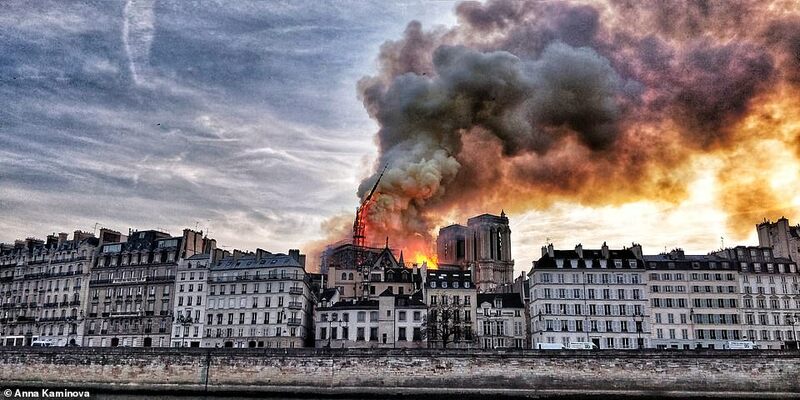 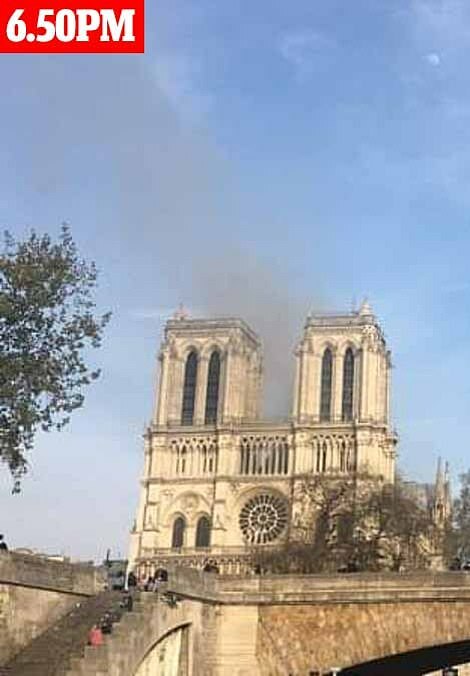 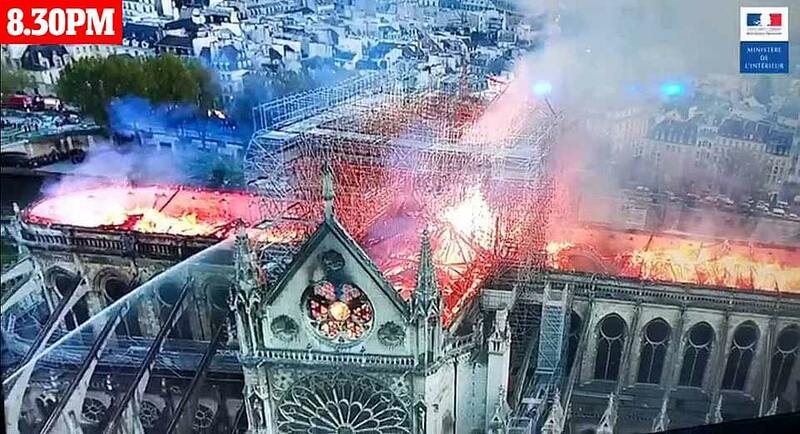 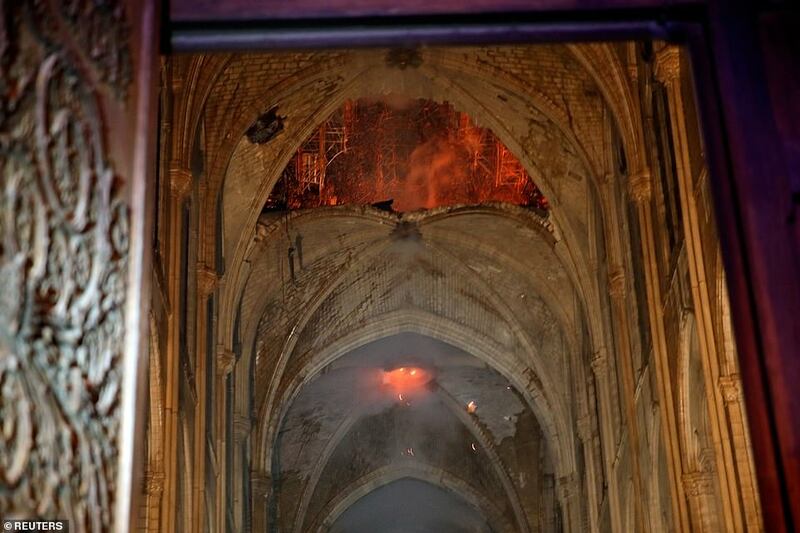 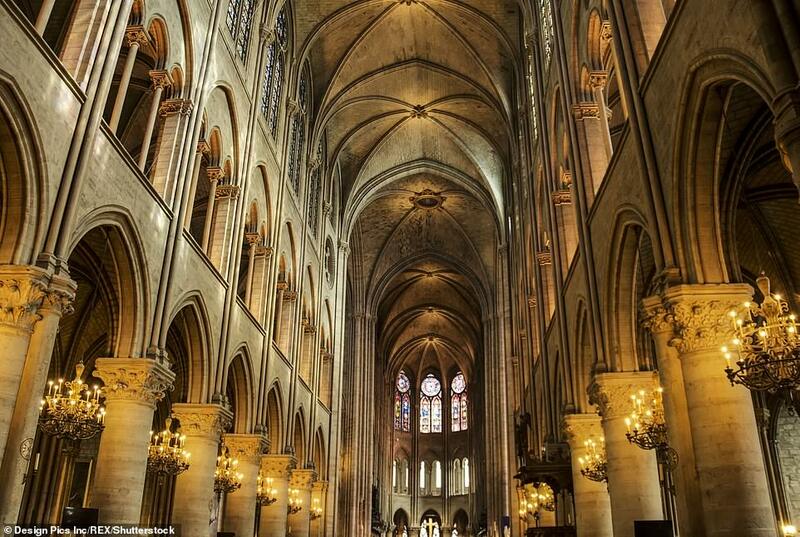 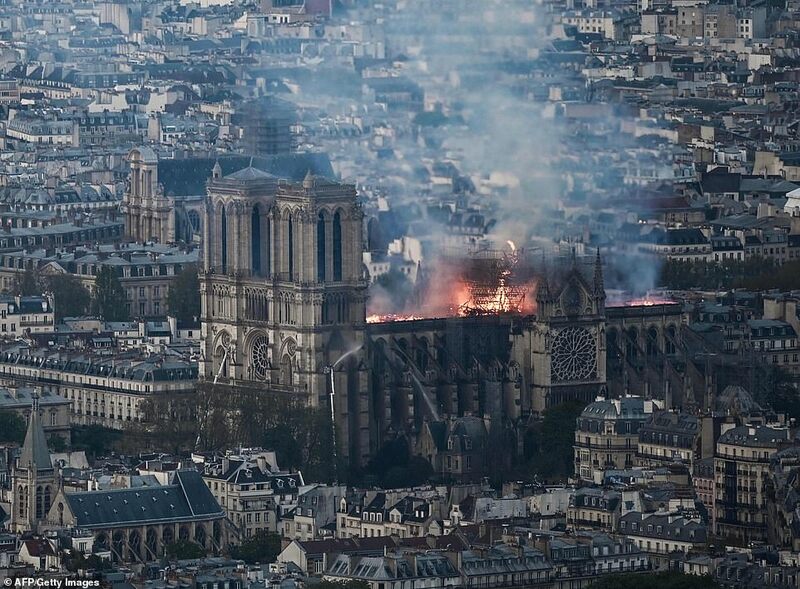 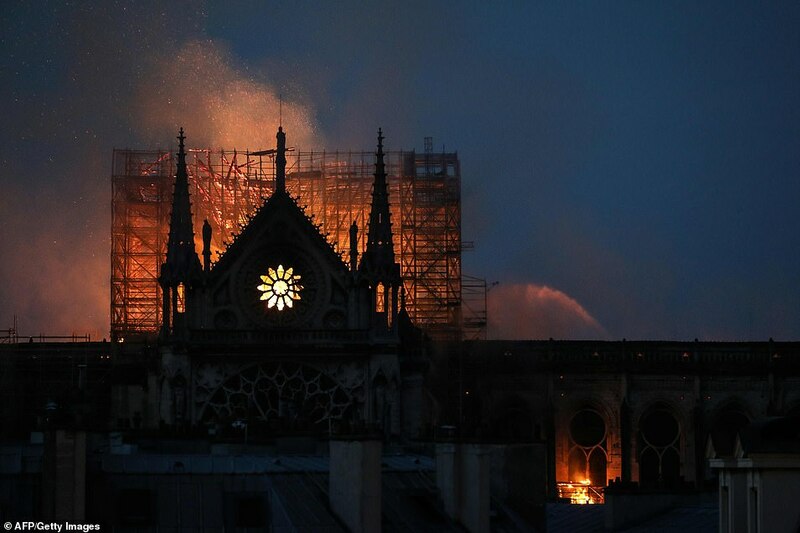 An elderly woman wondered whether the fire was a sign from god, saying: ‘Notre Dame is our soul. 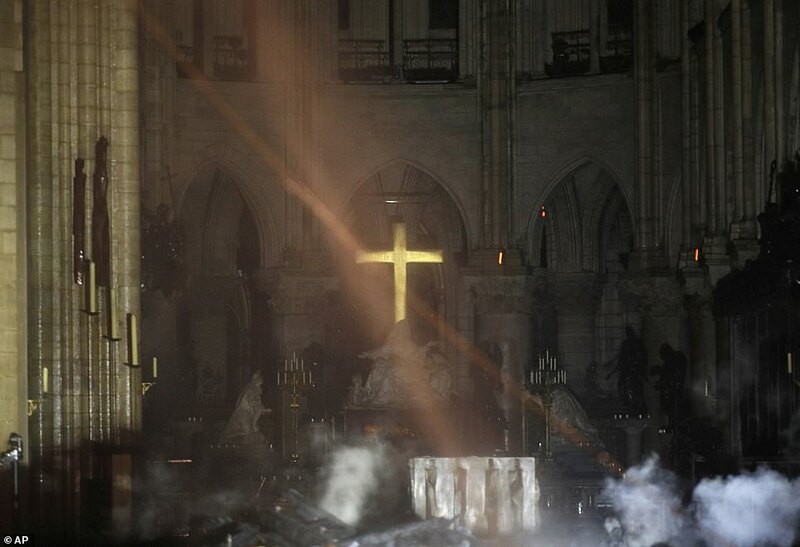 The soul of France. 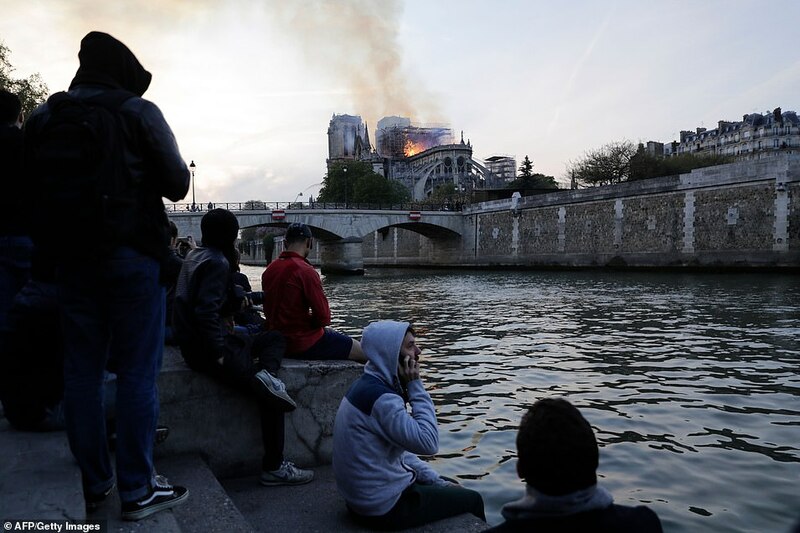 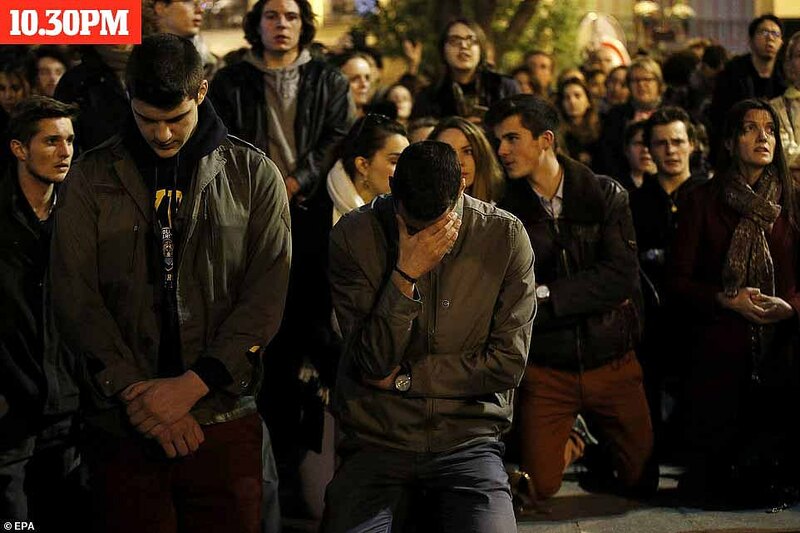 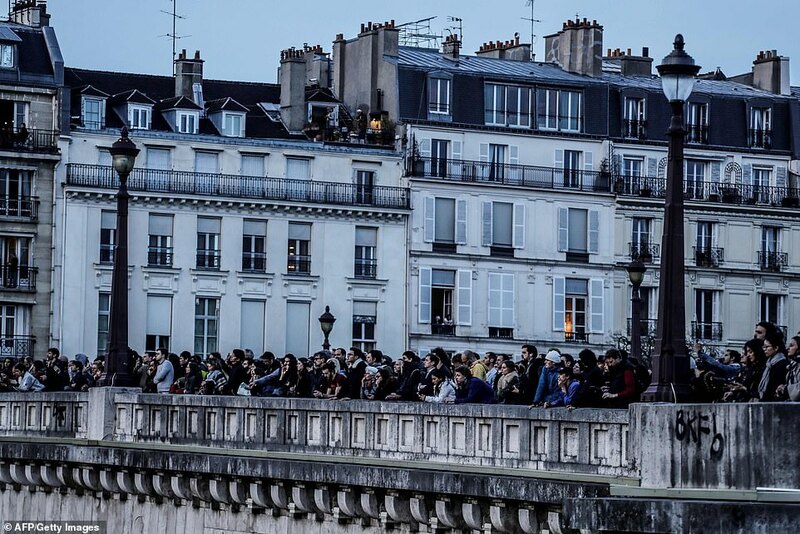 ‘But it’s hard to believe that this is happening in Paris – part of ourselves has been destroyed,’ he said.